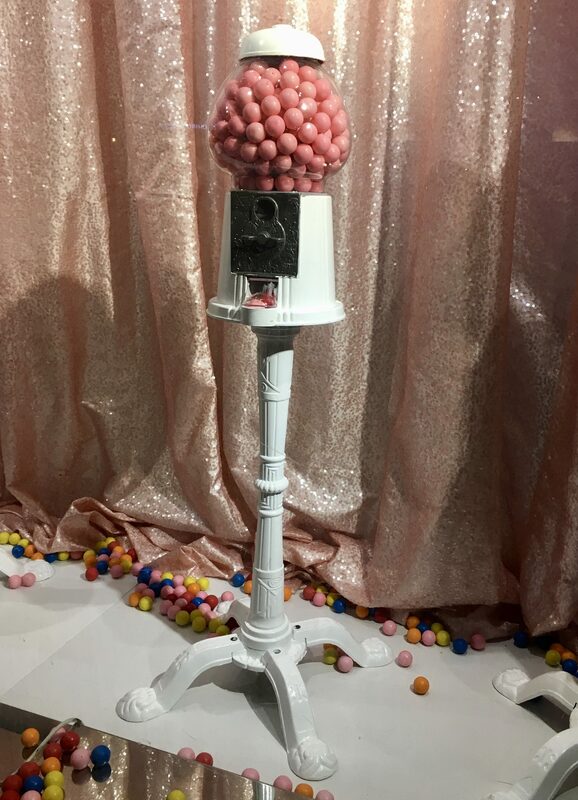 Pink Gumball Machine Window Display Photographed at Dylan’s Candy Bar, Located on Third Avenue between 60th and 61st Streets in NYC. Do you like to Snack? I sure do. For many of us, snacking choices are all about convenience — something that’s made to ‘grab and go’ around a busy schedule — but we also want a healthier snack that still feels like an indulgence. Sound challenging? It isn’t at all. 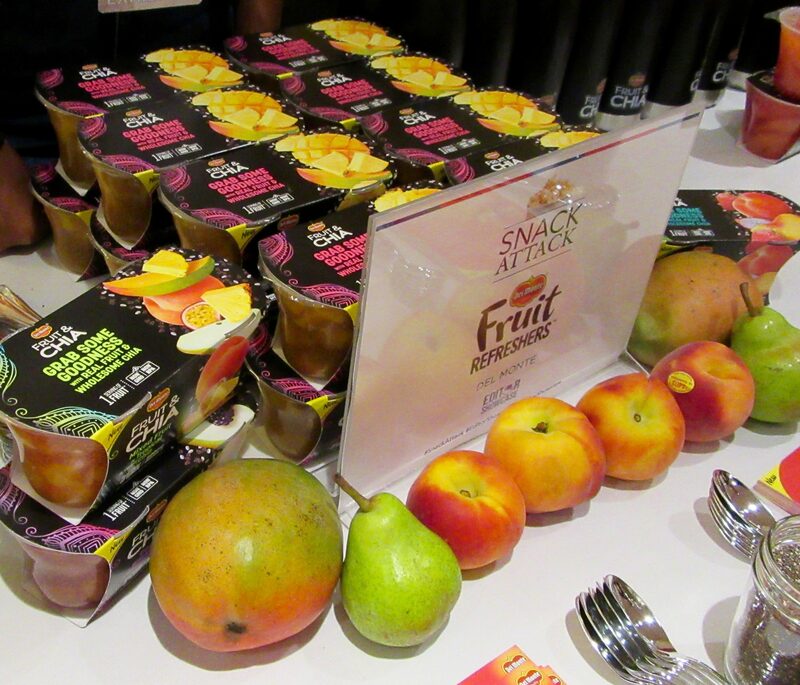 Just a couple of weeks ago, I attended the Editor Showcase Snack Attack edition of their quarterly brand showcase, held at the Marriott Marquis Hotel in Times Square, and had the chance to snack my way around the room, discovering all sorts of delicious and better-for-you snacks along the way. From Chips and Crackers to Candy and Nuts, here are some the brands we think you’ll soon be craving. Farmer’s Pantry is one of the hottest new companies to pioneer wholesome, substantial and irresistibly delicious snacks all grown on American Farms using original American Recipes. Like the name suggests, Farmer’s Pantry is passionate about creating scrumptious, hearty snacks using the kind of authentic, identifiable ingredients you would find in a farmer’s pantry! Every snack is lovingly crafted from some combination of meats, grains and vegetables. 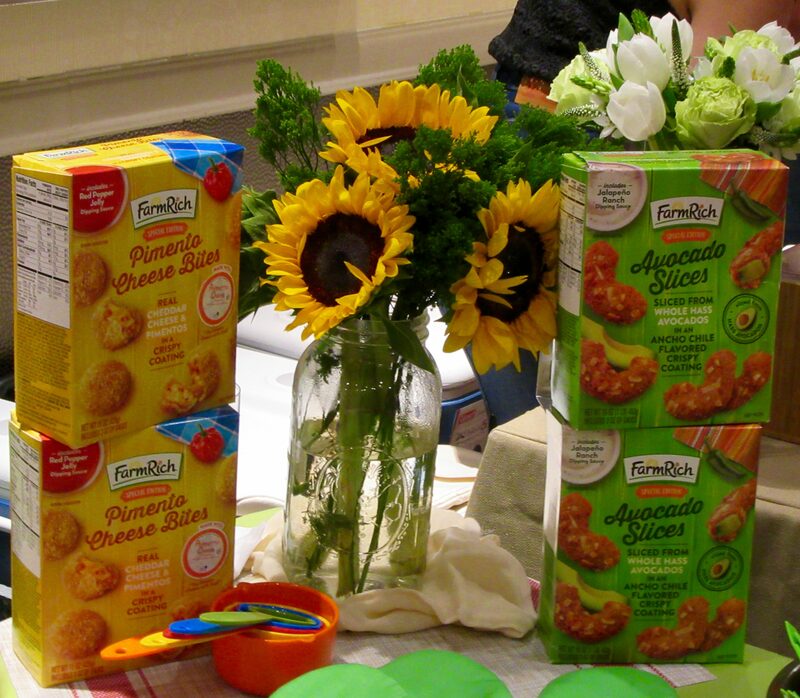 At Snack Attack, Farmer’s Pantry debuted two new snack lines. 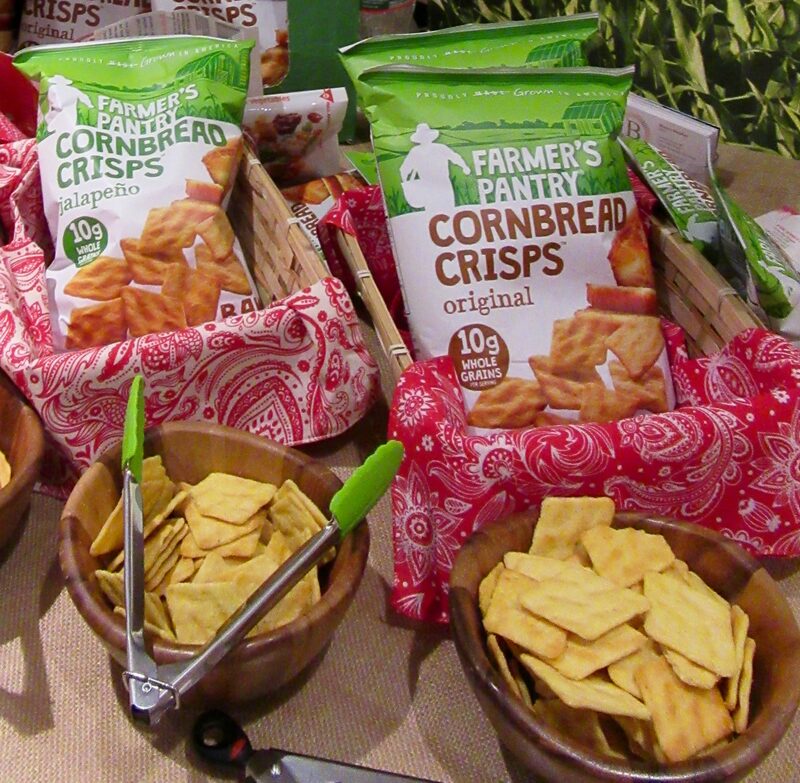 Farmers Pantry Cornbread Crisps, available in Original, Jalapeno, Honey-Butter and new BBQ flavors, are a crispy, savory baked snack made from fresh corn and other whole grains. 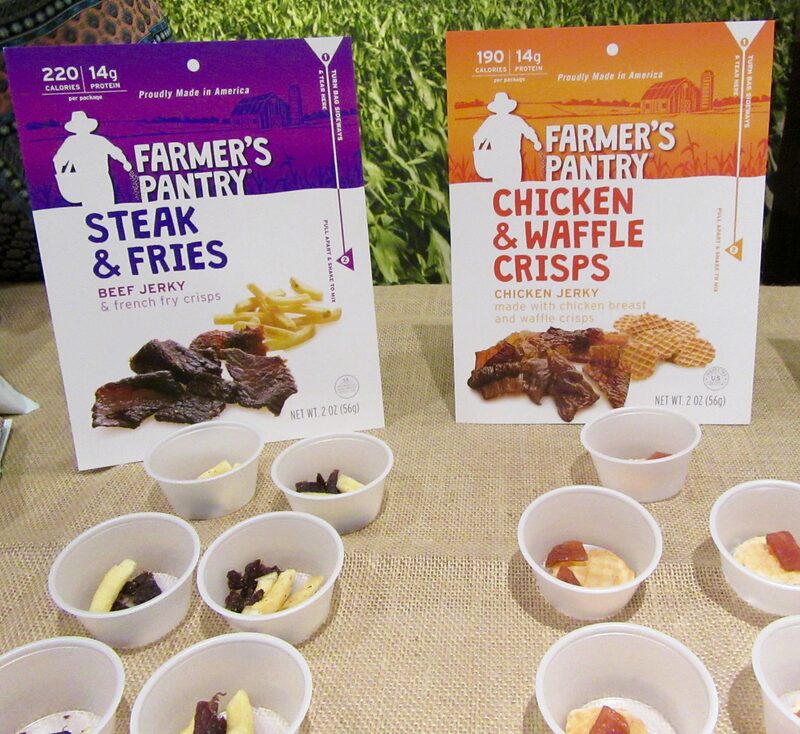 Farmers Pantry Meal Snacks are the only snacks on the market that combine protein-packed meat plus a side dish of vegetables, cornbread crisps or fries in one innovative package. Pictured above are the Chicken & Waffle Crisps, made with Chicken Jerky and maple waffles, and Steak’N Fries variety, made with Beef Jerky and french fries. It’s a snack revolution! With a history dating back to 1885, G.H. 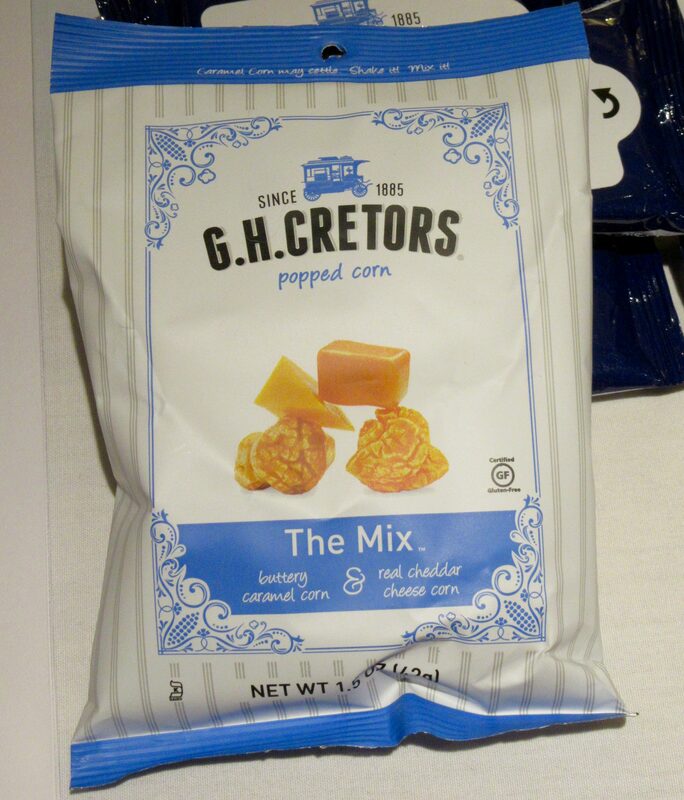 Cretors Popped Corn is a line of obsessively delicious popcorn in flavors that include bold, uniquely crave-able favorites like Chile Jalapeno White Cheddar and Dill Pickle! My favorite is The Mix, a one-of-a-kind blend of rich, buttery caramel corn and premium, aged cheddar cheese corn together in one bag, for a mouth-watering mix of sweet and salty — the taste is truly crave-able! Crafted in small batches in Waukegan, Illinois, all G.H. 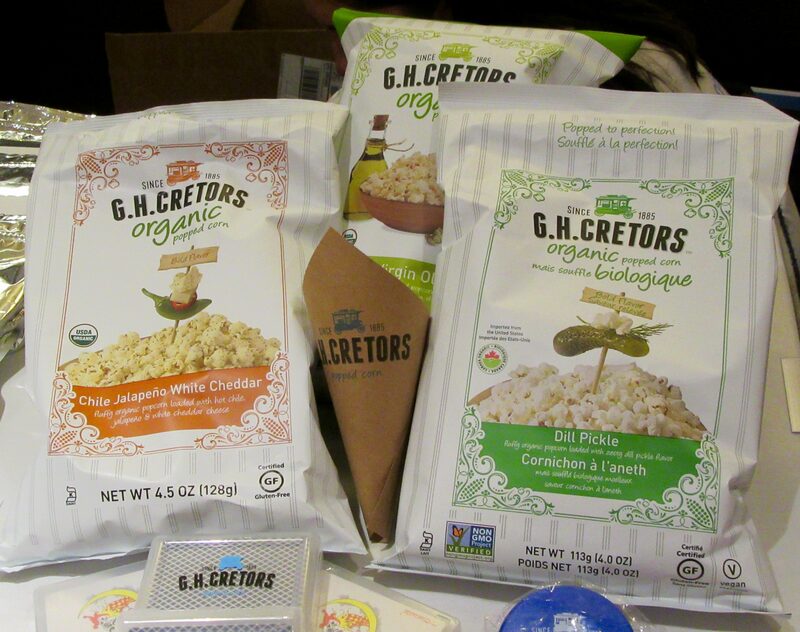 Cretors popcorn varieties are made with real, high-quality ingredients, using Non-GMO popcorn, and no artificial colors or flavors. 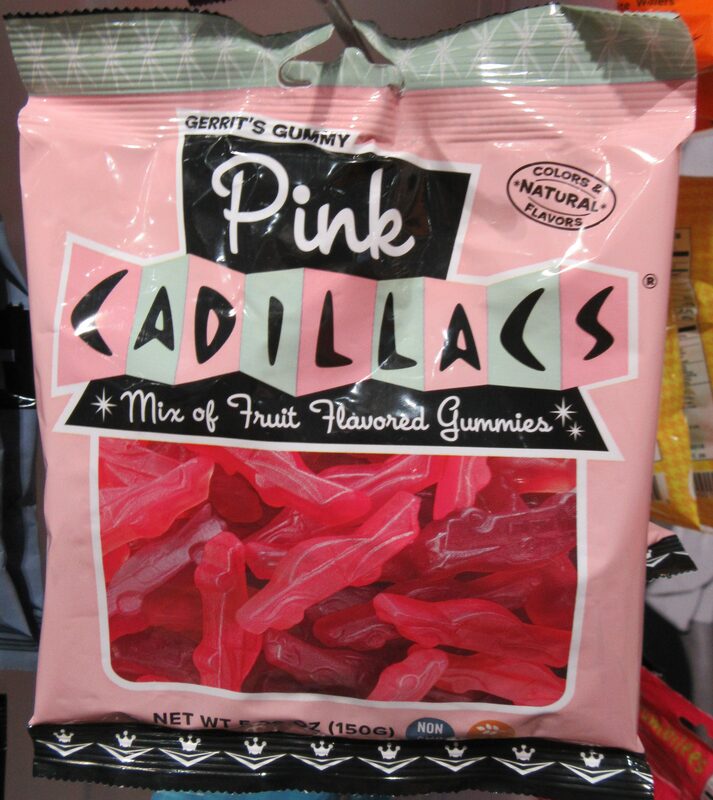 Available in 9 different flavors, snackers can enjoy G.H. Cretors at home, on-the-go, or anywhere else when the craving strikes. 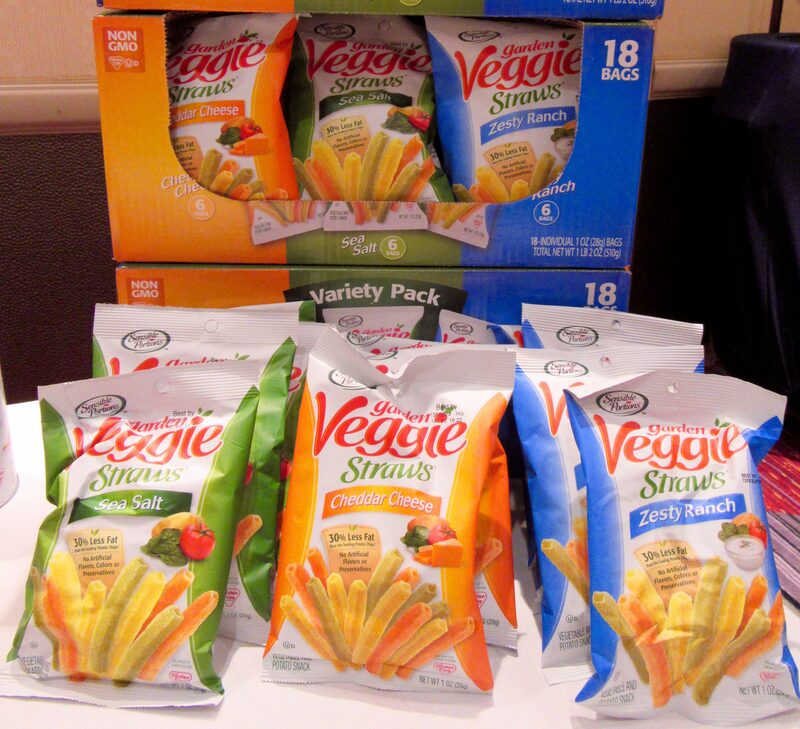 If you are a lover of chips, but grow tired of the same old potato or tortilla chips brands, Snack Attack had many alternative options to tempt your taste buds. Good Health Natural Products, Inc. is the creator of crunchy, crave-worthy snacks that make it easy to make better choices. 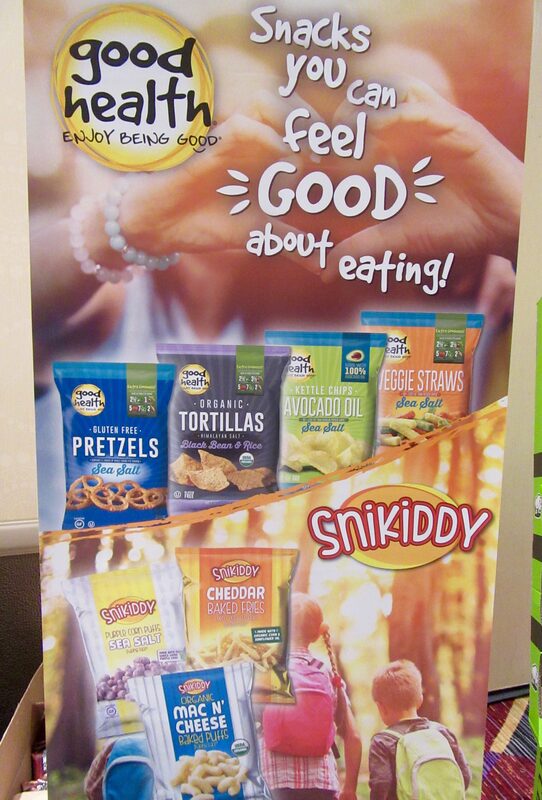 A trailblazer in common sense snacking, Good Health’s robust portfolio of snacks are made with better-for-you ingredients, like olive and avocado oils, whole grains, sweet potatoes and vegetables – all so you can Enjoy Being Good (as their slogan implores) without sacrificing great taste! Good Health Black Bean & Rice Organic Tortillas are dynamite with dips, guacamole and salsa, and they’re absolutely unbeatable with cheese! Serve them proudly alongside all of your homemade Mexican favorites! Their Gluten Free Pretzels are also a must-have party snack! Sharing booth space with Good Health, we found the Snikiddy snack line; delicious snacks created by two moms and made from simple, wholesome, real-food ingredients. 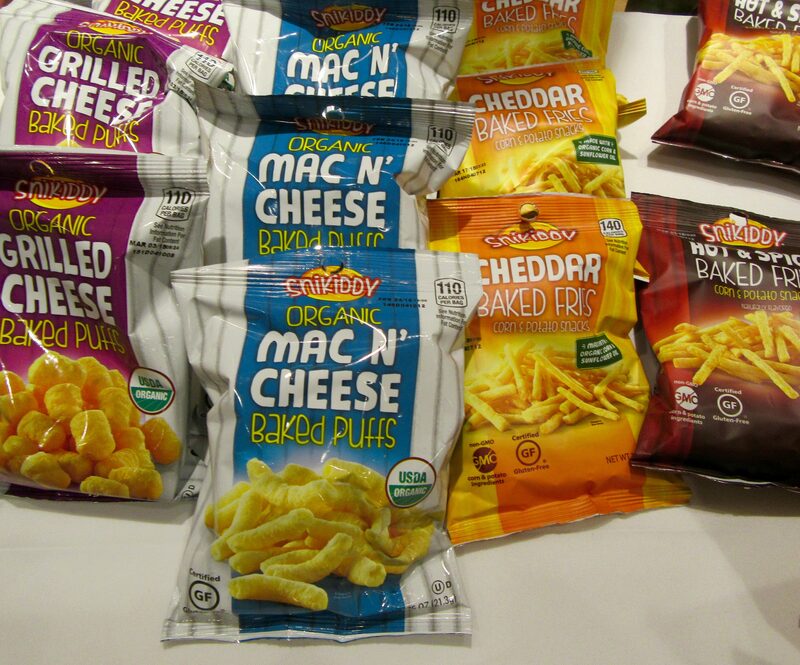 The brand recently underwent a product line upgrade and now offers organic Grilled Cheese Baked Puffs and Mac N’ Cheese Baked Puffs (both so crunchy and cheese-e-licious), plus whole grain Purple Corn Puffs, and Baked Fries, made with organic corn and sunflower oil. 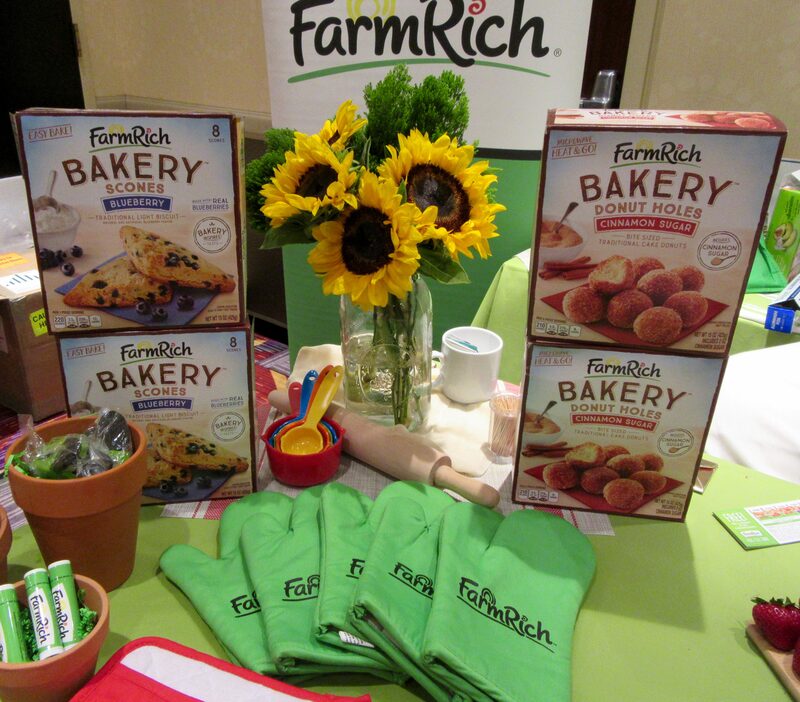 All Snikiddy snacks are certified Gluten Free, Kosher, Non-GMO and contain only healthful, natural ingredients. 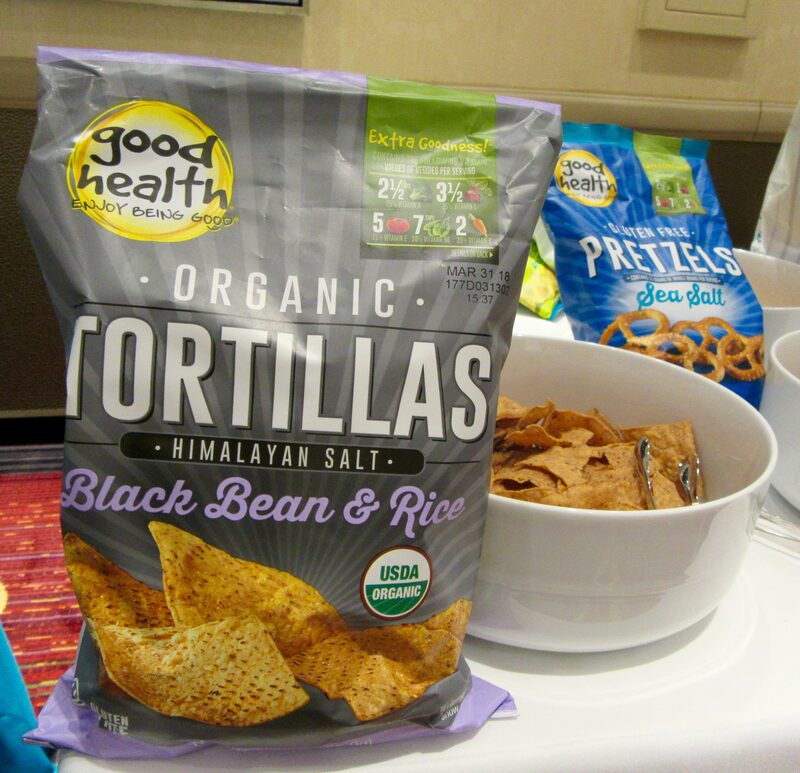 Hain Celestial, a leading organic and natural products company, offers a selection of delicious snack options, including: Garden of Eatin’ tortilla chips made with organic corn; family-friendly Sensible Portions Garden Veggie straws and chips; and TERRA real vegetable chips. I don’t know about you, but if I’m at a party and I see a bowl of TERRA chips, I will pick out all of the sweet potato chips and eat them myself. 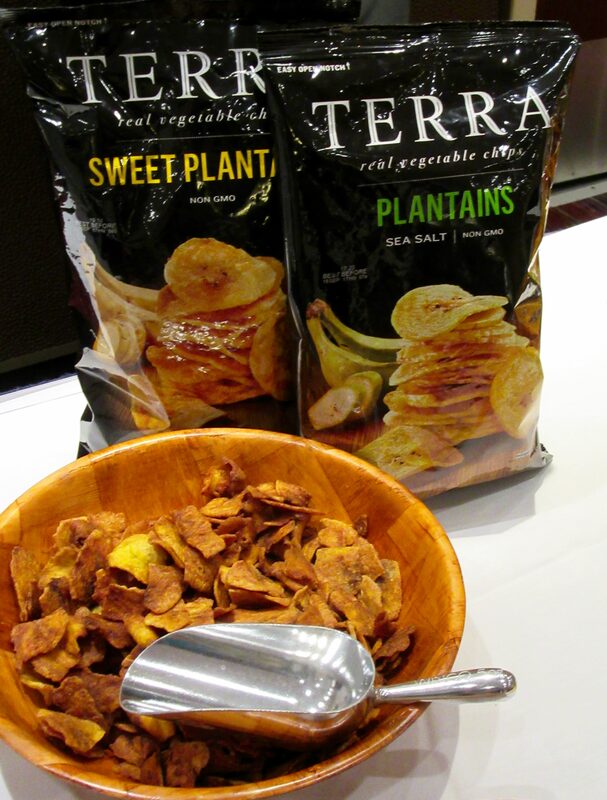 New at Snack Attack were two flavors of TERRA chips: Sweet Plantains and regular Plantains! Yummy! 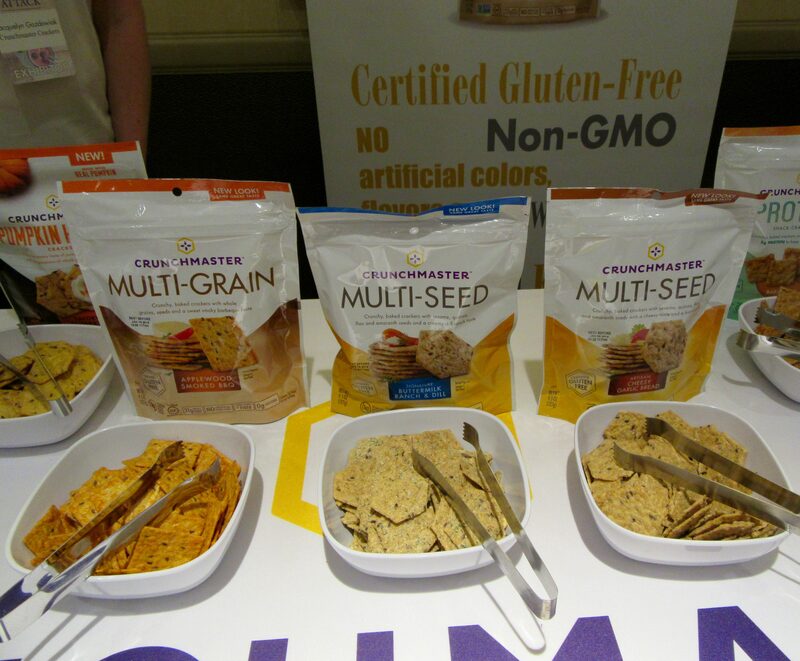 Crunchmaster Crackers are a sturdy, bold-flavored cracker made with whole grains, seeds, and . . . that’s about it. 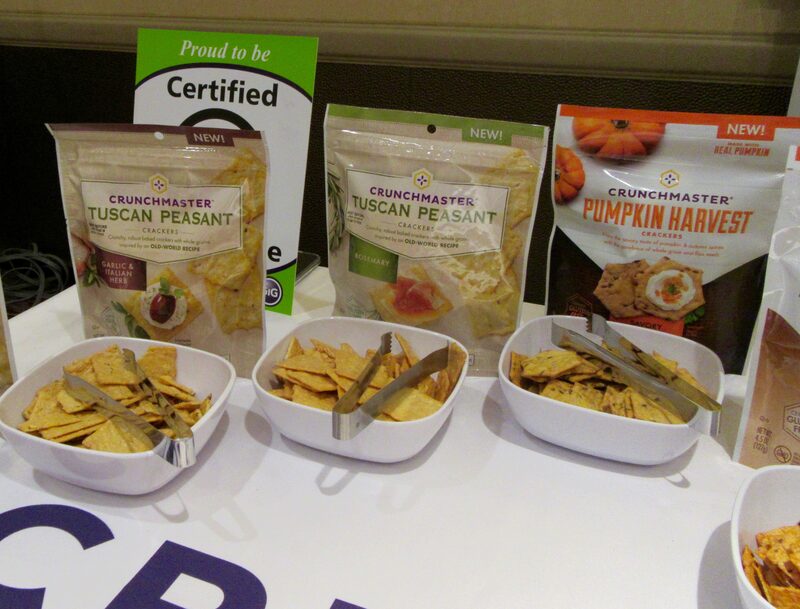 Showcasing at Snack Attack were several new Crunchmaster varieties: Protein Snack Crackers with five grams of plant-based protein per serving, Tuscan Peasant Crackers (perfect for topping with your favorite cheeses, spreads or tapenades), and a new seasonal flavor, Pumpkin Harvest, with a savory pumpkin flavor, which will be available in the fall — just in time for the holiday entertaining season! Never fear: there were plenty of sweet snacks to give the crackers and chips a run for the money! If you’re not already familiar with Sheila G’s Brownie Brittle, the crispy brownie snack, then you have some catching up to do! 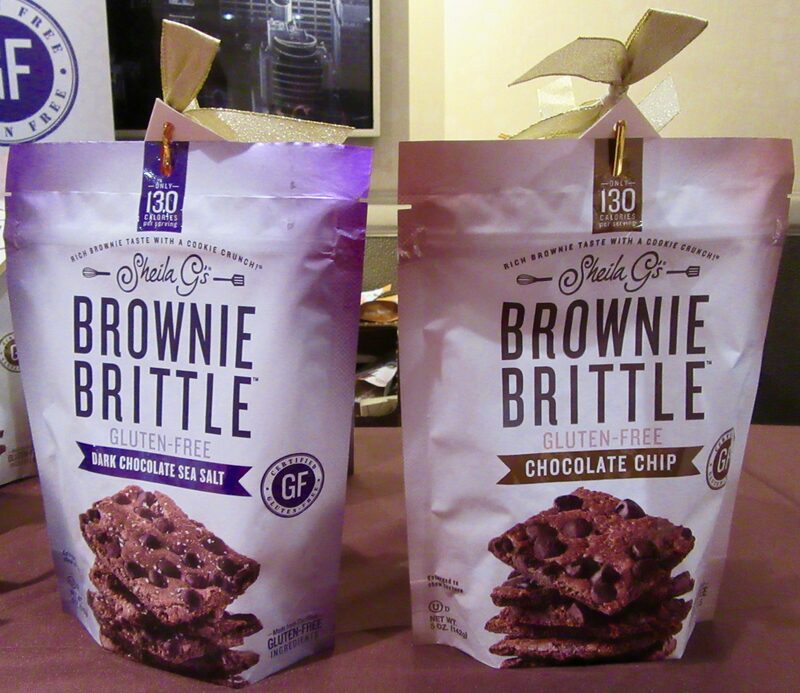 The Brownie Brittle family continues to expand to include new gluten free Brownie Brittle in two varieties: Dark Chocolate Sea Salt, and Chocolate Chip! We were also introduced to (I can’t even believe I am about to type this) Brownie Brittle Cookie Bites: crisp morsels of chocolate chip cookies covered in creamy Milk Chocolate. Insane! It may have all started with the Teddy Graham, but the Teddy brand of baked treats is about so much more. Brand new on the shelf are Teddy Soft Bakes, fluffy, soft-baked filled treats in the fun shape of a bear. 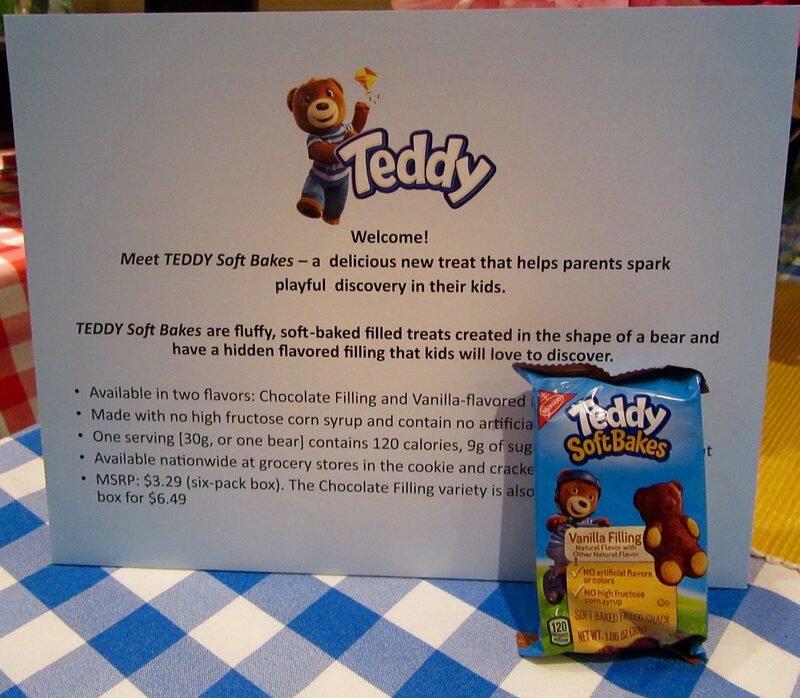 Teddy Soft Bakes are individually-wrapped, snack-size cakes with a hidden flavored filling that kids will love to discover. They can be an ideal snacking option that helps spark playful moments of discovery and natural curiosity. Teddy Soft Bakes come in two varieties: Vanilla Cake with Chocolate Filling, and Chocolate Cake with Vanilla filling. 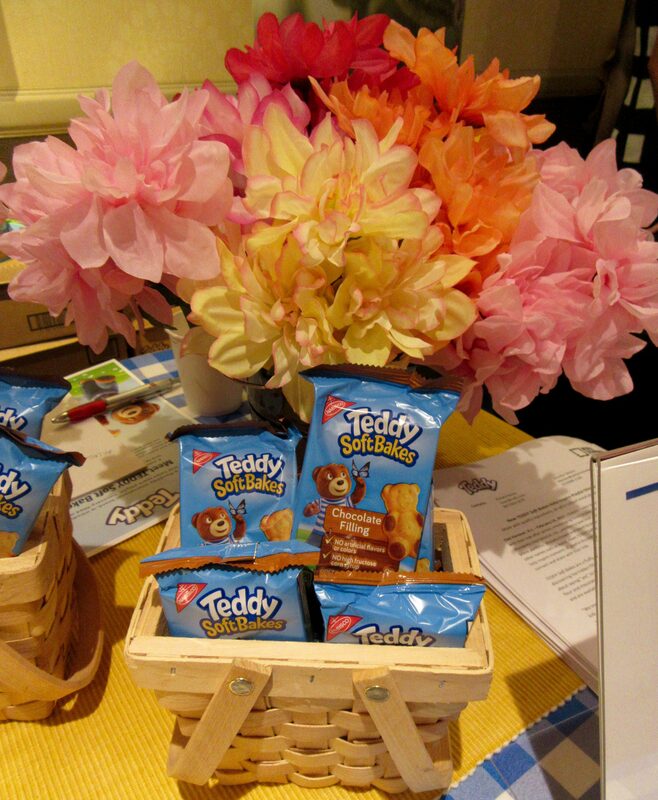 A perfect treat for the Back-to-School lunch box, Teddy Soft Bakes are the Bomb. 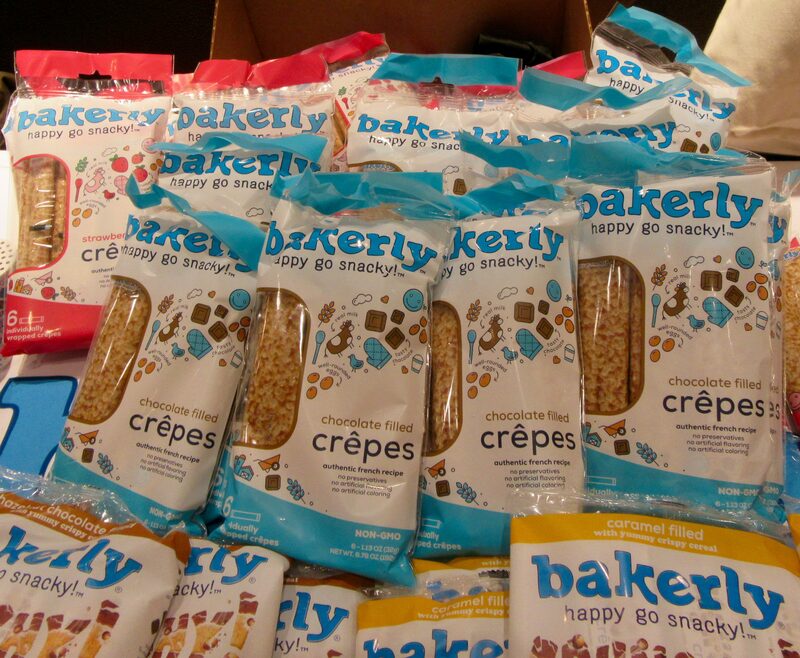 If I had to choose just one item as my Favorite Thing of Snack Attack 2017, it would be Bakerly Crepes Snacks. Bakerly Crepes are made from an authentic French recipe using simple, pure ingredients like milk, eggs wheat flour, chocolate, real fruit and other natural flavors, and they are baked by artisan bakers! 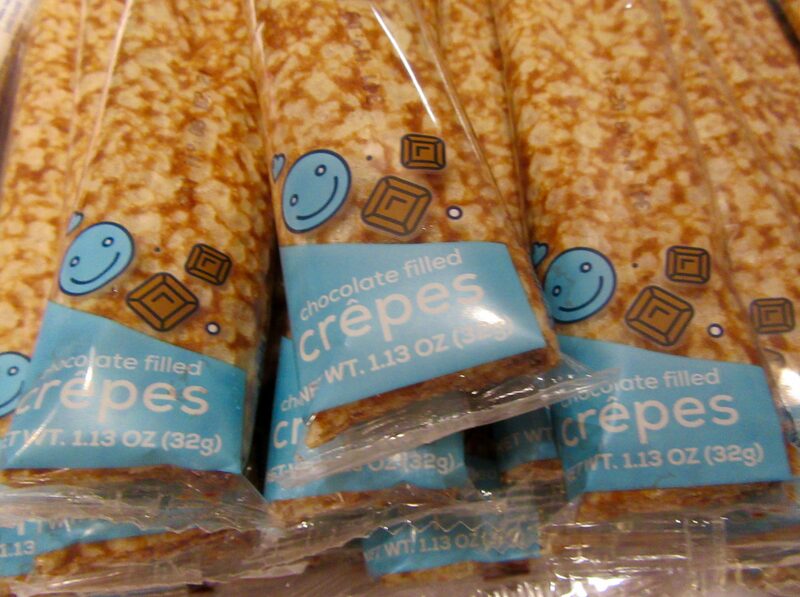 Once you taste them, you will have no doubt as to why Bakerly Crepes are the #1 snack in France! C’est si bon! 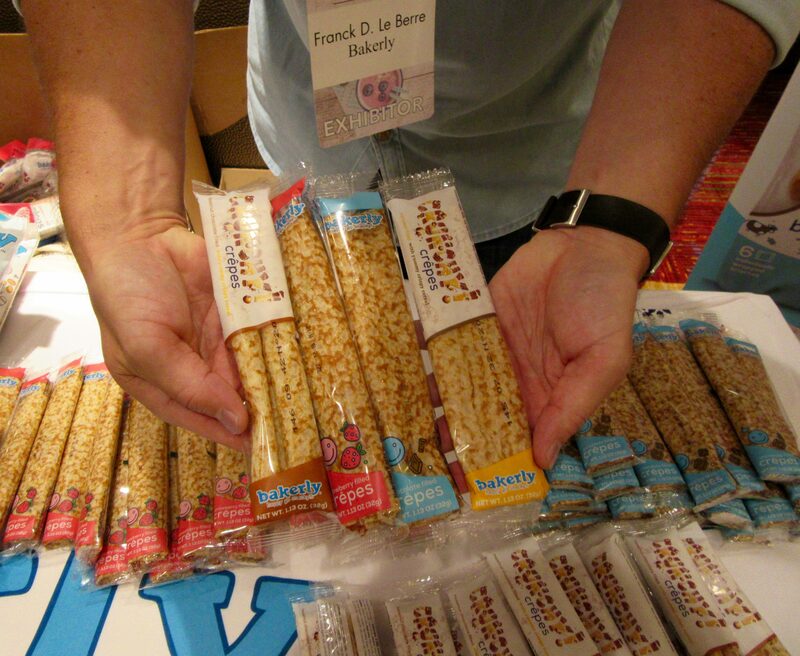 Here, we see a variety of delicious Bakerly Crepes held in the loving hands of Brand Ambassador Franck, who gave me a most generous amount of samples — including the flavors Chocolate, Strawberry, and Crunchy, featuring Crispy Rice Cereal and Chocolate Hazelnut filling — to snack on at home. Merci, Franck! National S’Mores Day was just celebrated on August 10th, but in case you missed it, Snack Attack reminds us that all of the ingredient in everyone’s favorite campfire treat — a warm, toasted marshmallow and piece of milk chocolate sandwiched between to graham crackers — can be made right in your own home, or even your own backyard! 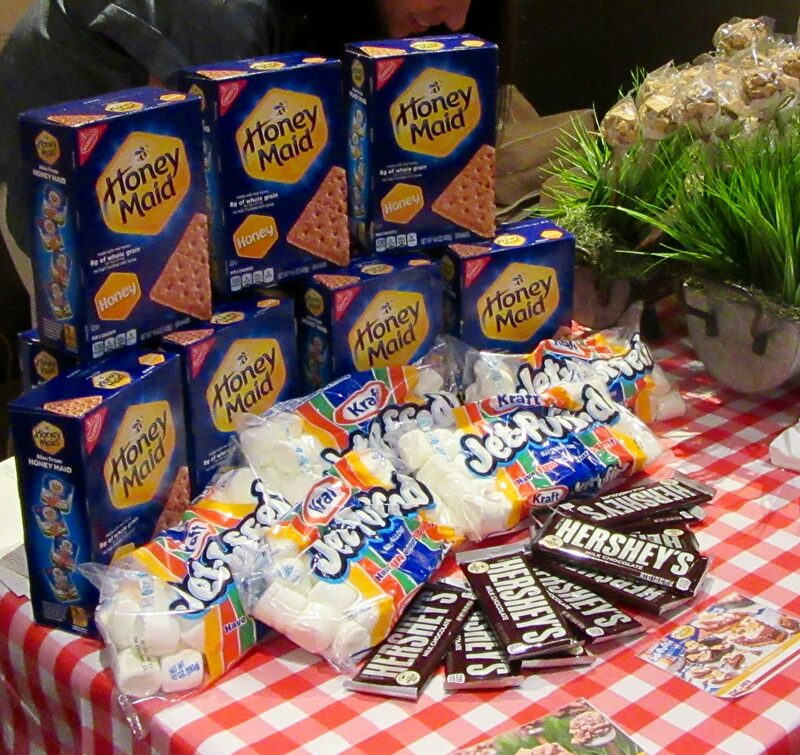 The brand trio of Honey Maid Grahams, Hershey’s Milk Chocolate and Kraft Jet-Puffed Marshmallows has named S’Mores as the Official Dessert of the BBQ! In addition to receiving one of every item pictured on the table above, Editor Showcase attendees learned about fun and easy recipes for making S’Mores Skillet Pizza, and . 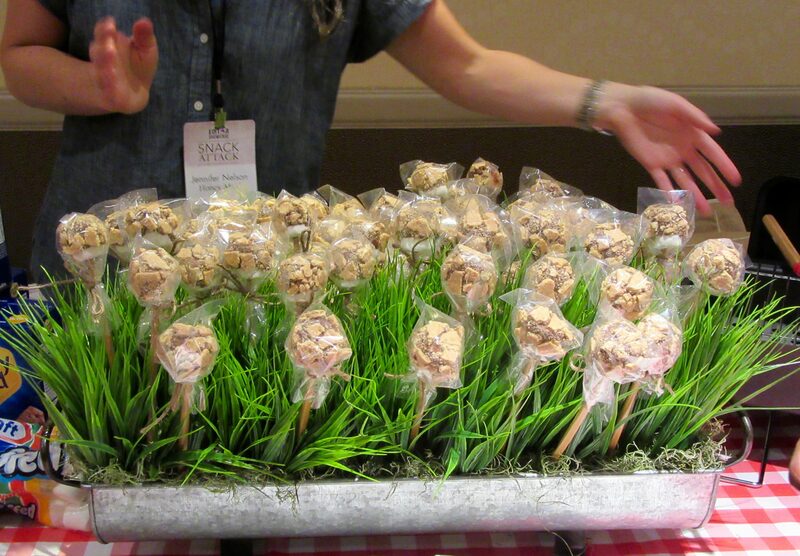 . .
S’Mores on a Stick, which is a delicious, no-bake treat! Find those, and other summer recipes, at This Link! 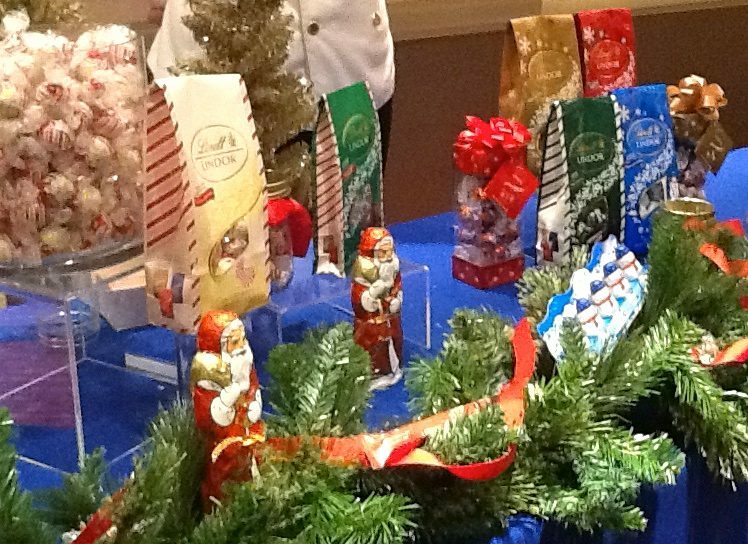 You may have grown accustom to seeing Bahlsen cookies around the Christmas holidays, but did you know that over 125 years, generations of the Bahlsen family have baked European cookies to be enjoyed across the globe? From their crisp butter biscuits to the indulgent chocolate selection, there is something delicious for every occasion. All Bahlsen cookie recipes are made with love, using only the very highest quality ingredients, for a truly exceptional cookie. 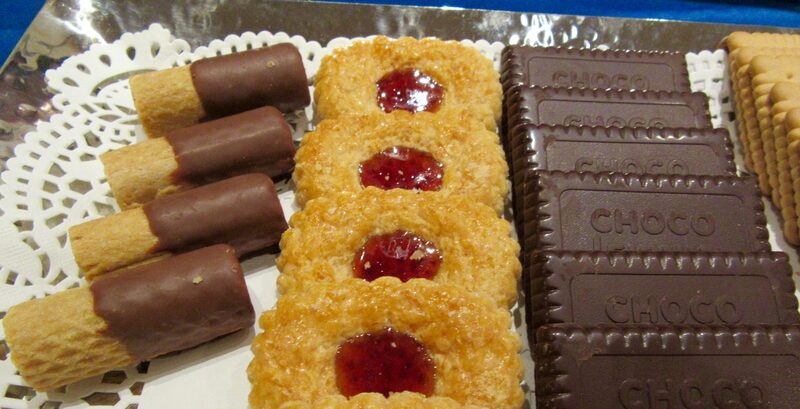 My favorites are the Choco Leibniz (above, right) — with a lavish layer of European Milk Chocolate atop the original Leibniz butter biscuit — and the Waffletten (above, left) made from a crunchy wafer rolled into fine, crisp layers, and then dipped into rich European chocolate (these are so great with ice cream). 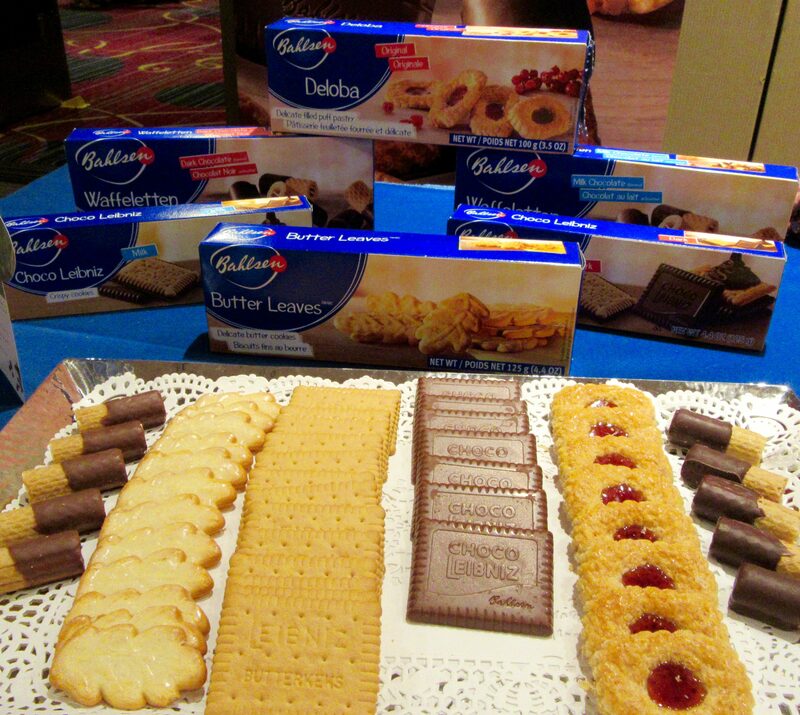 Don’t wait for a special occasion to serve these excellent baked goods; treat yourself and your family to a box (or two) of Bahlsen cookies right now! Do you like chocolate? I got yer chocolate right here. 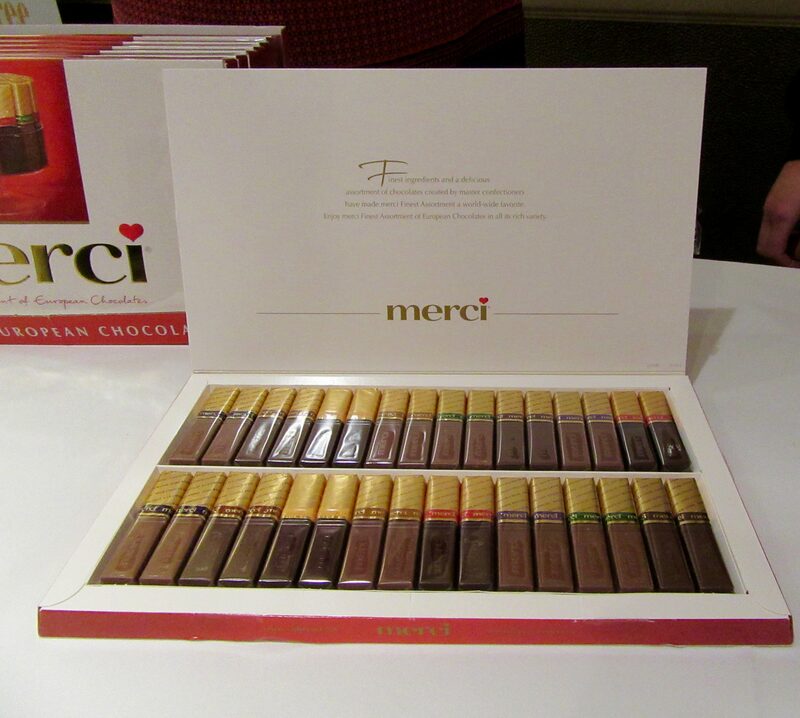 merci’s Finest Selection offers fine European chocolates especially chosen and packaged to give as Thank You gifts or as any gesture of sincere appreciation. 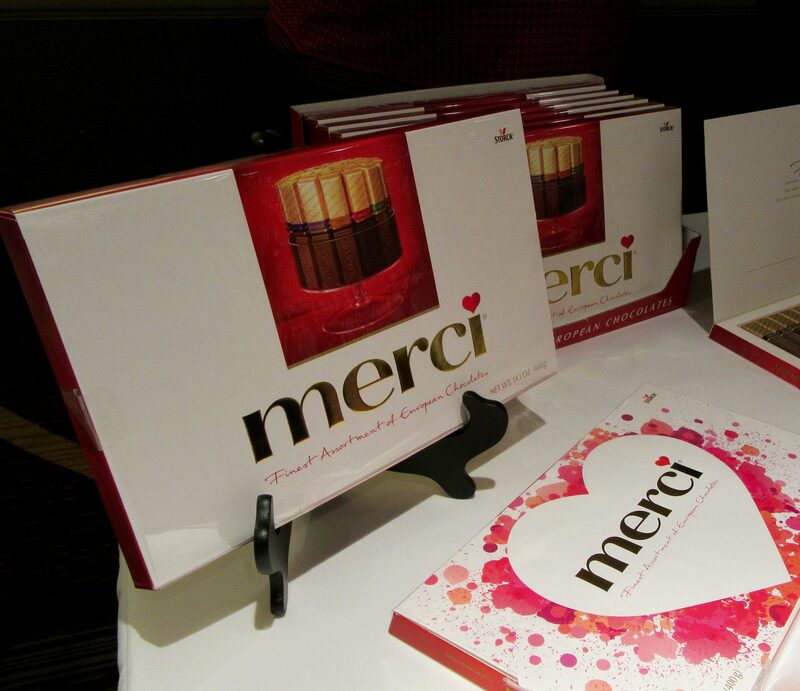 Known as Europe’s famous gift-giving chocolate, merci offers something for every taste. What a great idea!! Each slim, stylish box contains eight unique, individually wrapped flavors including Milk Chocolate, Coffee and Cream, Hazelnut-Almond, Hazelnut-Creme, Marzipan, Dark Creme, Dark Mouse and Praline-Creme. 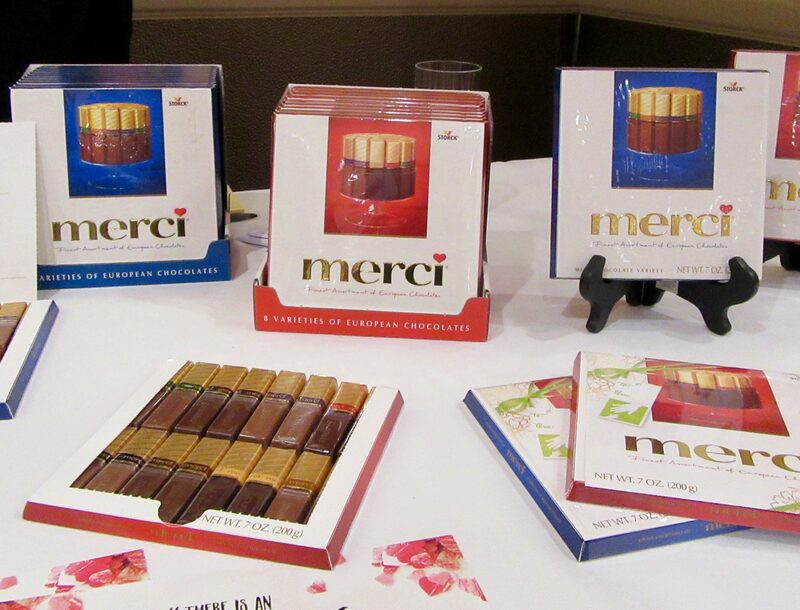 merci is available in grocery stores nationwide, and can also be ordered online with your own custom packaging if desired (shipping domestically or internationally) at This Link. 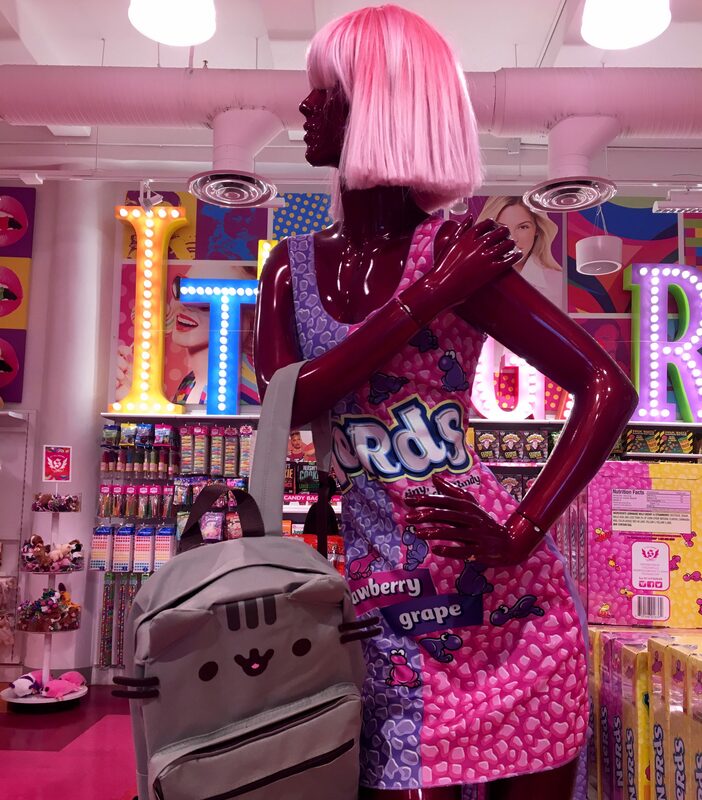 HI-CHEW Candy has long been the #1 soft candy in Japan, but it also has a large fan following in America. 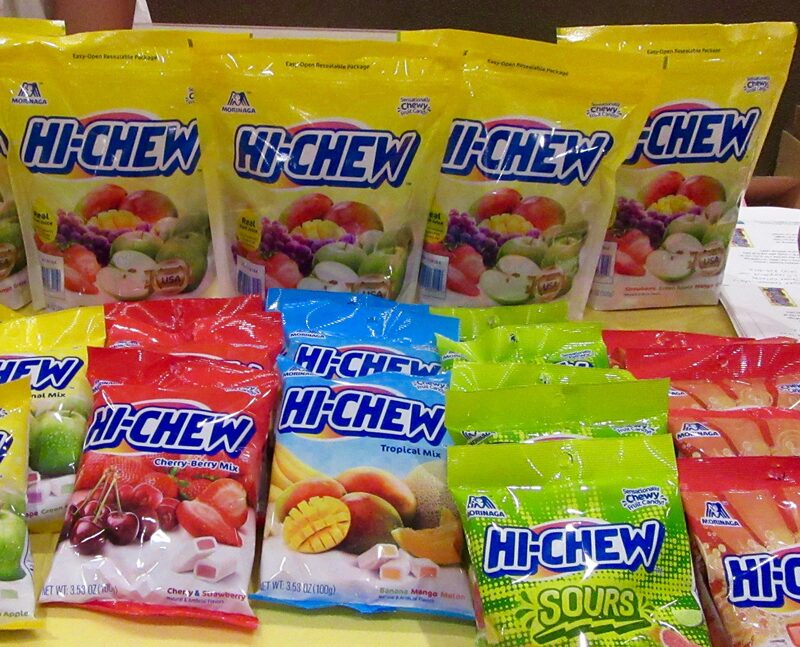 Sometimes, I even make a special run to my favorite Asian Import Store downtown, just to stock up on my most-addicted-to HI-CHEW flavors! 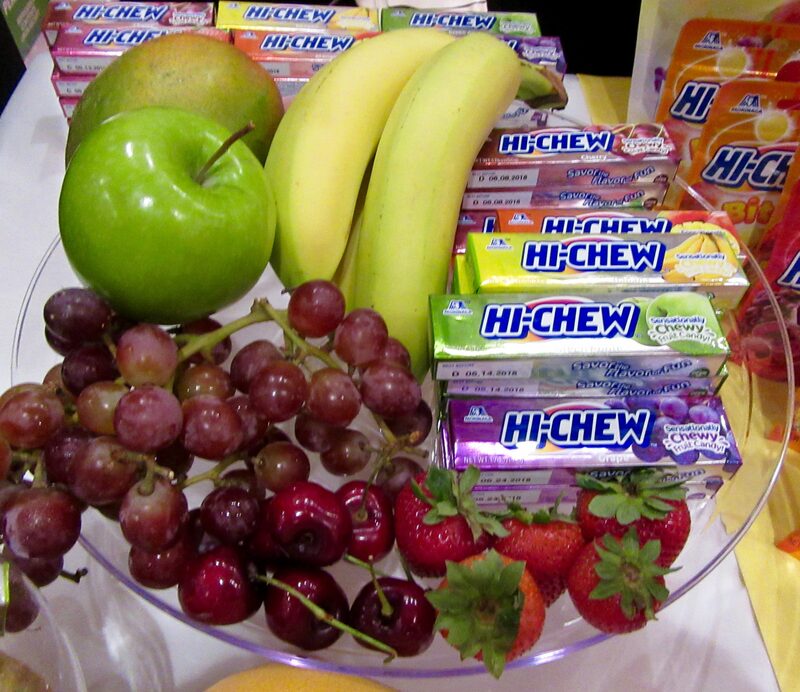 Similar to a Starburst in texture (but far superior in taste), HI-CHEW is made with real fruit juice and purees, and comes in Strawberry, Green Apple, Mango, Grape, Cherry, Banana (the best! ), and Melon. 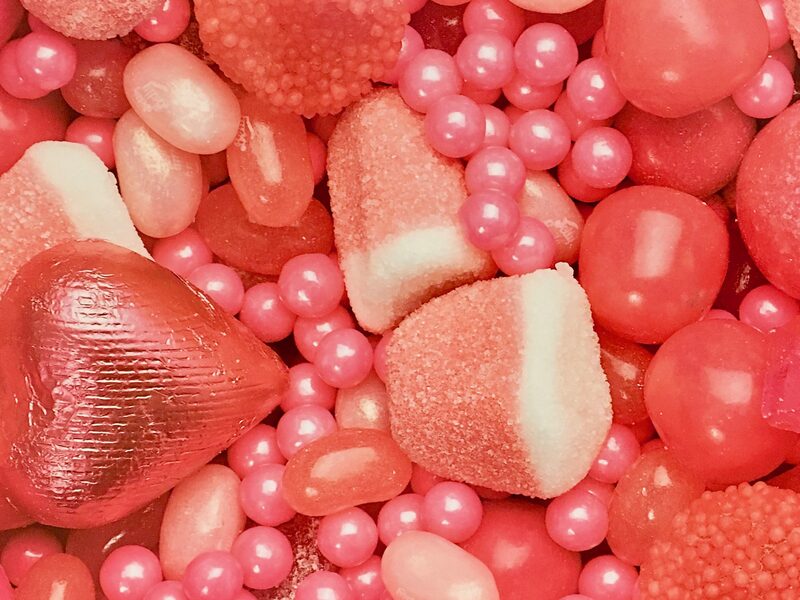 HI-CHEW Sours come in Lemon, Lime and Grapefruit, while new HI-CHEW Bites, offered in Grape, Strawberry, Mango, and Orange, provide your favorite HI-CHEW chewiness with a hard candy shell. Excellent! Speaking of fruit, it is still a popular thing to snack on! If you are like me — loving fruit, but hating to have to take the time to peel it and cut it up, then Naturipe Fruit Snacks are going to make you very happy! Healthy and convenient Naturipe Snacks pair fresh strawberries, blueberries, and grapes with creamy cheeses and crunchy nuts in one portable package. This better-for-you snack satisfies hunger while offering protein, fiber, Vitamin C, and calcium. 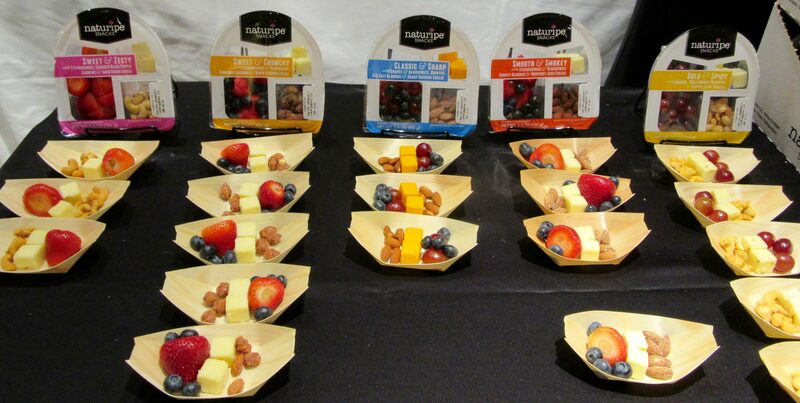 Available in a six tastefully curated fruit, cheese, and nut combinations ranging from sweet to savory and mild to spicy, Naturipe Snacks are a perfect pick for nutritionally balanced ready-to-eat snacking at home and on-the-go — with no preparation time required! Yay! 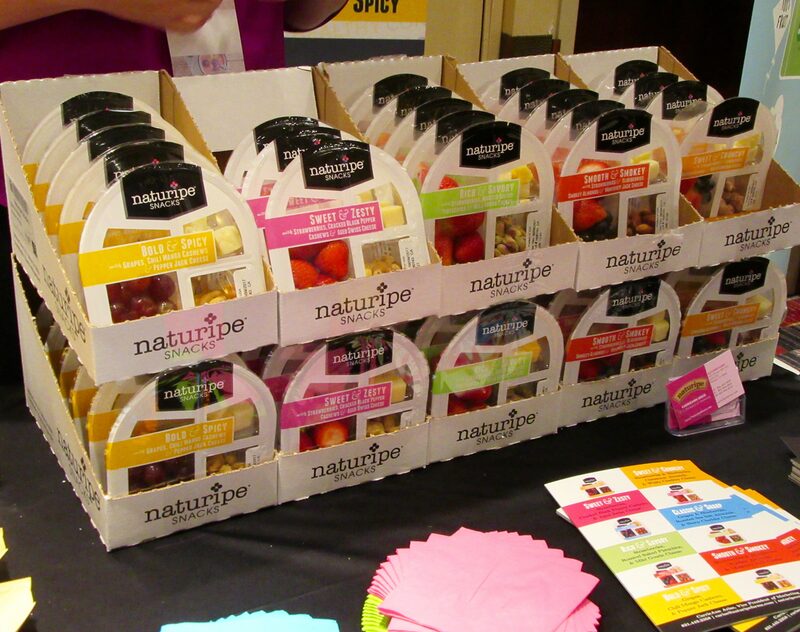 Naturipe Snacks offers simplified snacking for health-conscious foodies. And it makes a great, healthy After-School treat for the kids as well! Del Monte is a trusted brand name that’s also introducing a new fruit snack. 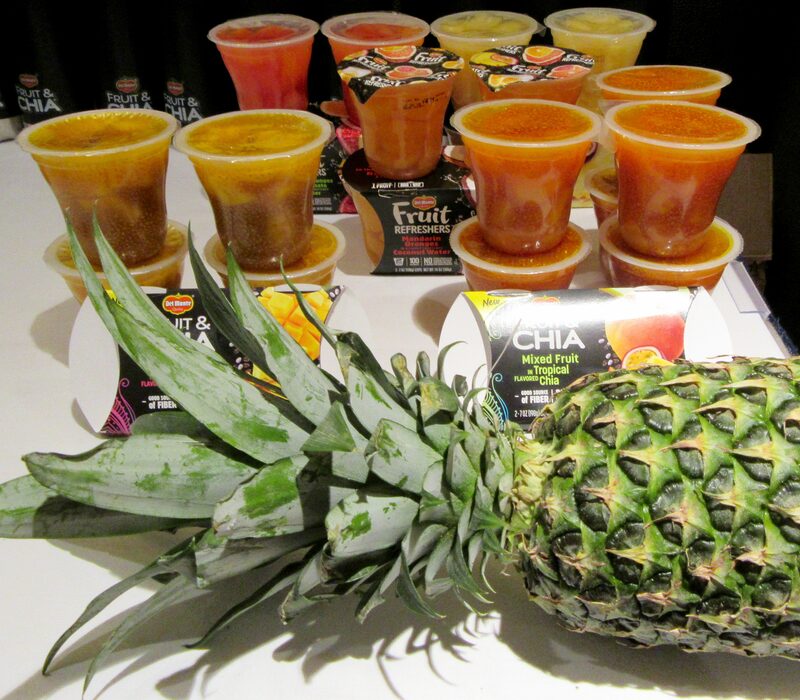 Del Monte Fruit & Chia is a Fruit Cup snack for adults that kids may just love also. Packed with luscious chunks of real fruit and wholesome chia seeds, this is a delicious snack that will leave you feeling satisfied on-the-go. Del Monte Fruit Refreshers combine exciting fruits with slightly sweetened Fruit Waters to create enticing flavor combinations for a refreshing pick-me-up any time of the day! Cute brand mascots on the table always get my attention: the GoGo squeeZ brand had two of them! 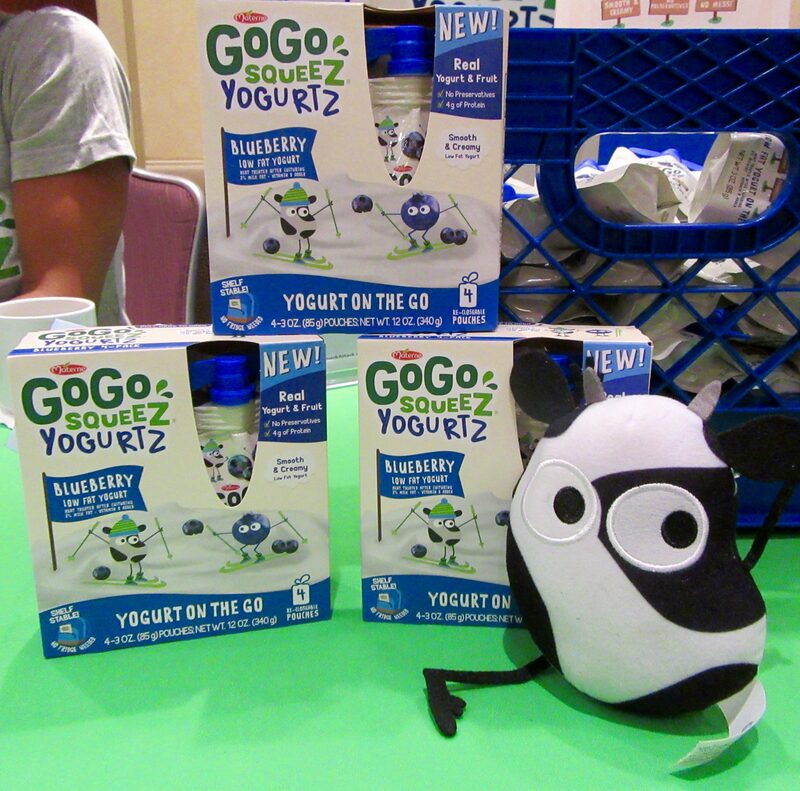 First, check out this adorable little bean-shaped Cow, representing for GoGo squeeZ YogurtZ, which brings together scrumptious real yogurt and fruit, with protein, calcium and Vitamin D. Conveniently, it’s all packaged in the iconic GoGo squeeZ pouch. But wait there’s more: GoGo squeeZ YogurtZ needs absolutely no refrigeration! Mind blown! Also part of the GoGo squeeZ family is Applesauce On The Go, the leading squeezable, 100 percent fruit applesauce in a pouch. Look at that Little Green Apple: it’s killing me with the cuteness. 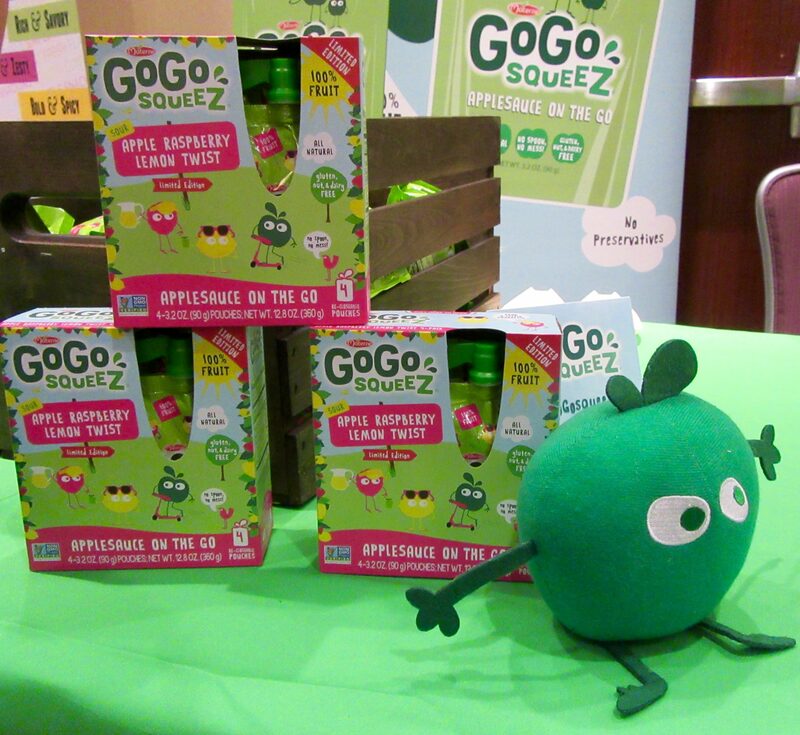 With over 30 varieties of squeezable yogurt, fruit and vegetable snacks, GoGo squeeZ is a brand you need to know! When I was a small child back in the stone age, my Mom would give me and my brother cottage cheese mixed with fruit as a snack, and we just loved it. Guess what: now those two things come already mixed together! 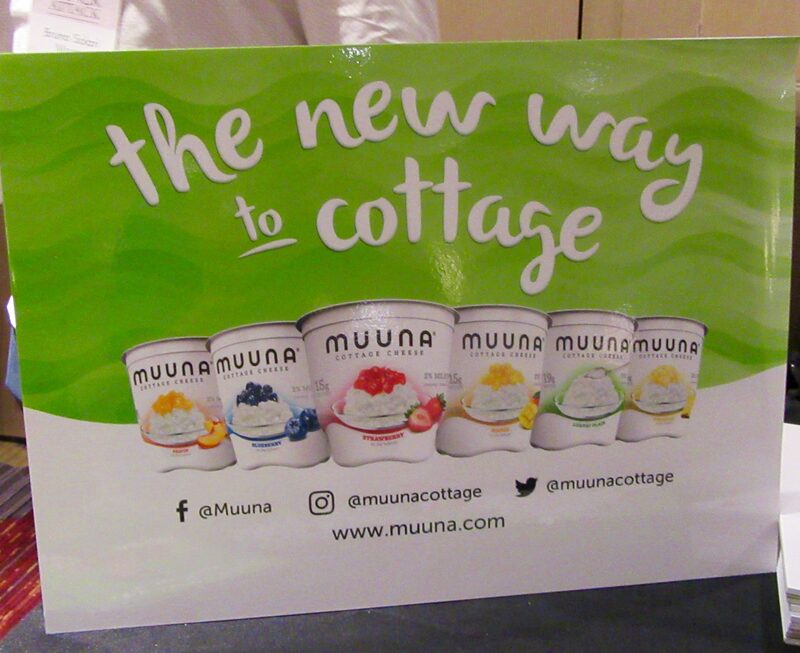 Muuna is on a mission to change the way consumers think about cottage cheese, having re-imagined it with a new line of melt-in-your-mouth creamy, single-serve cups with delicious pieces of fruit, including Strawberry, Blueberry, Pineapple, Peach and Mango. Kill me! Each 5.3oz cup has 15 grams of protein and only 130 calories. 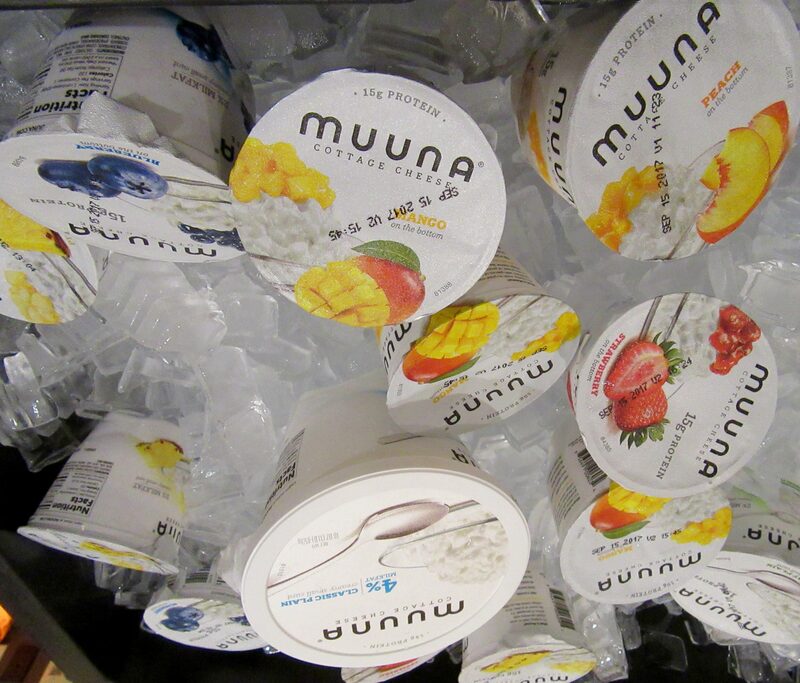 Muuna also offers its single-serve cup in Lowfat Plain, which contains 19 grams of protein and 120 calories. 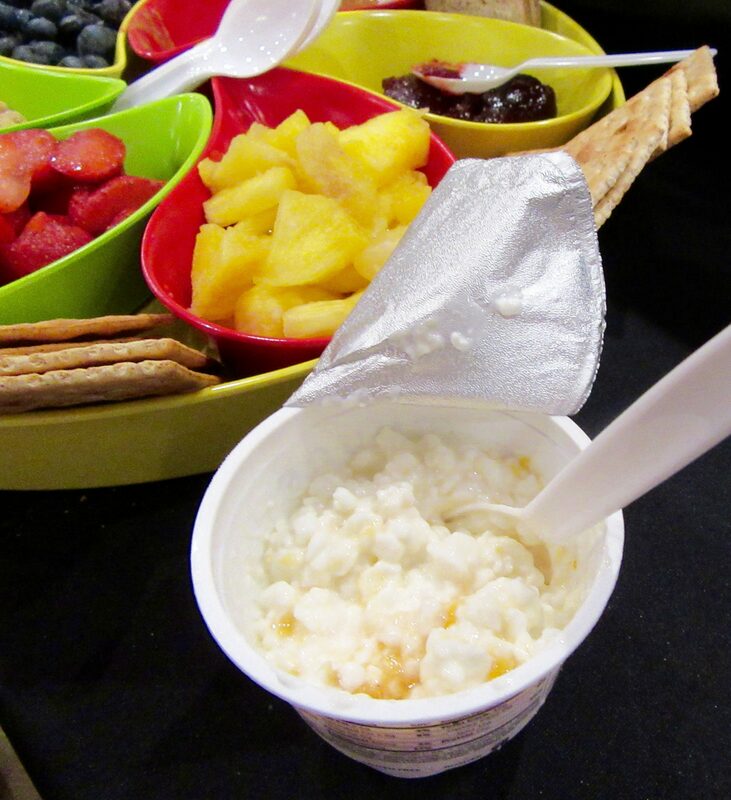 At Snack Attack, the Muuna booth offered a selection of chopped fruit and other toppings that you could mix in with your already-mixed-together cottage cheese and fruit, but I didn’t need any of that, because I am a purist. Here is the tasty cup of Peaches and Cottage Cheese — Just Like Mom Used to Make — that I enjoyed very much! Nostalgia! Hey do you like cheese? I sure do. 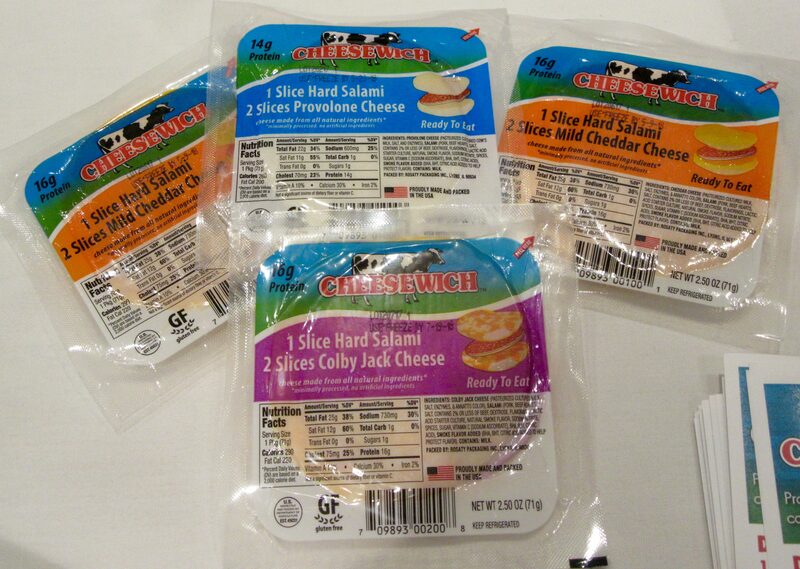 How cool do you think it would be to make sandwich where two slices of cheese were substituted for the bread? 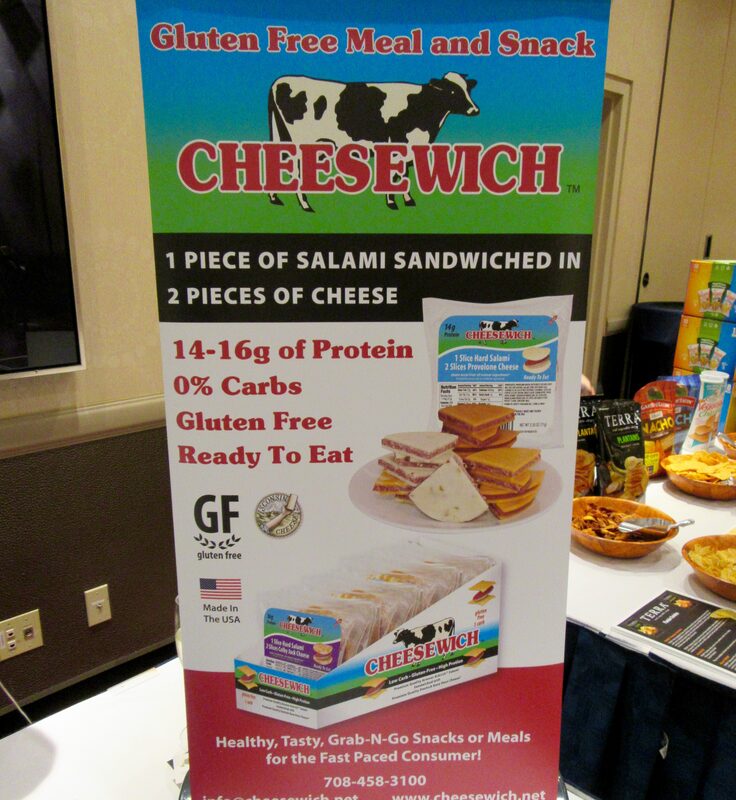 No carbs, no gluten – just a delicious slice of hard salami between two slices of all natural Wisconsin cheese – a Cheesewich, if you will. That’s right: somebody already thought of it, and they were at Snack Attack. There are a few different varieties of Cheesewich — with Provolone, Mild Cheddar or Colby Jack Cheese — so you can change it up. You could even use the Cheesewich as a filling to make a regular sandwich, if you just absolutely had to have the bread. I would never judge you. 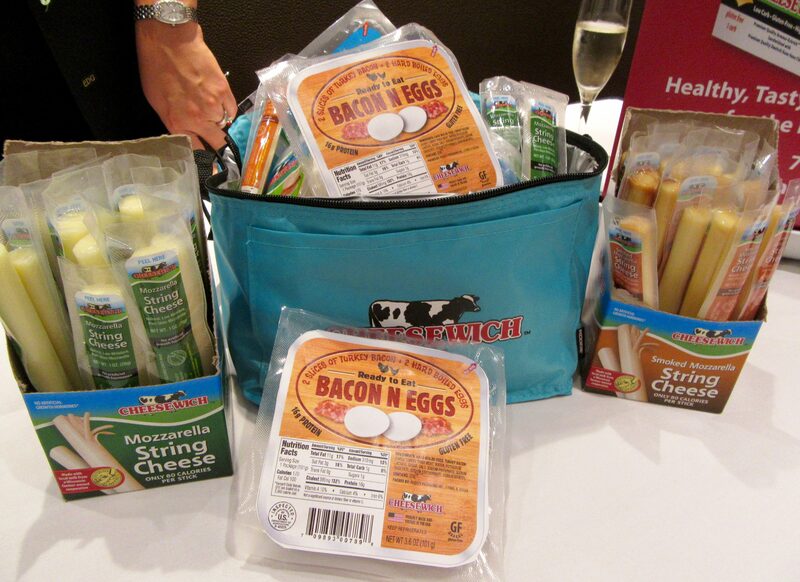 Cheesewich is also growing its snack product line to include other high protein, grab-and-go snacks like Mozzarella and Smoked Mozzarella String Cheeses, and a ready-to-eat Bacon N Eggs Breakfast snack, with two hard boiled eggs and two slices of turkey bacon inside an easy open pouch. Eggs-cellent! 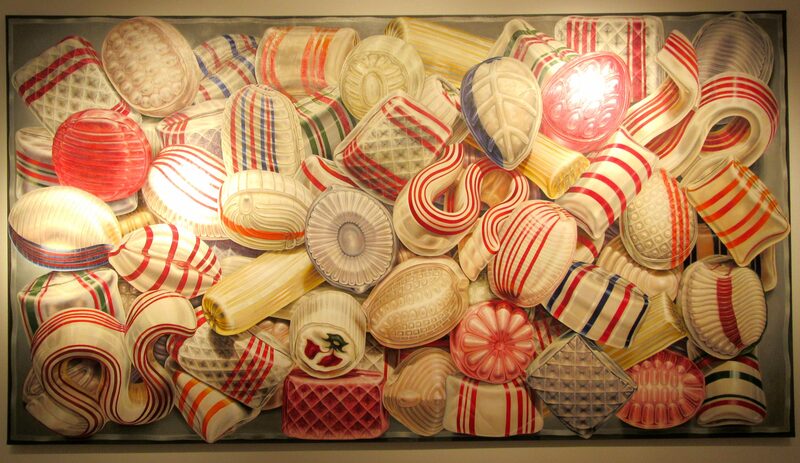 At Cucina & Amore: Kitchen of Love, they create an old world cuisine with a modern twist. 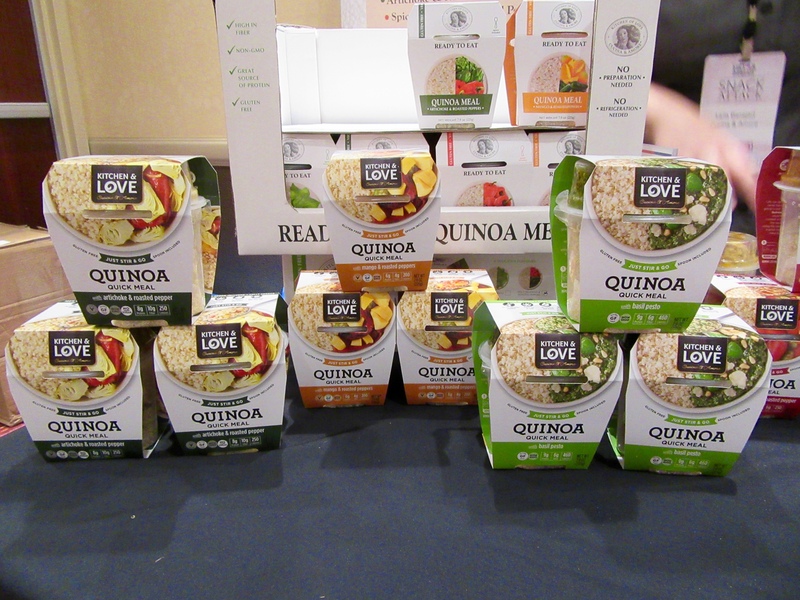 Cucina & Amore’s new ready-to-eat Quinoa Meals leave a busy person with no excuse to skip lunch, because each healthy and tasty meal is fully cooked and ready to eat! Gluten, preservative and GMO-free, these meals are jam packed with nutrients to keep you energized during your long day. Available in four different flavors like Spicy Jalapeno and Roasted Peppers, Basil Pesto, Mango & Jalapeno and Artichoke with Roasted Peppers, co-workers will think you’re eating a dish that you cooked and brought from home. Each prepackaged quinoa meal comes in a microwave-safe container, but they can also be enjoyed cold, or at room temperature, which means they are perfect to take on-the-go, or if you only have a short lunch break. Delicious, healthy and so easy! Kitchen of Love products are available at grocery stores nationwide. 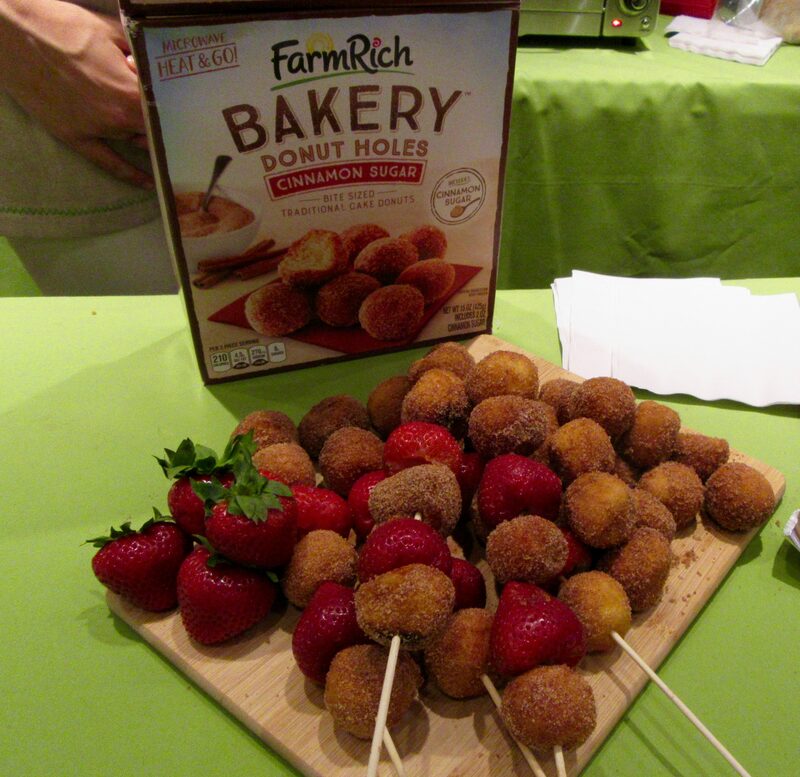 Farm Rich Bakery Cinnamon Sugar Donut Holes offer fresh-baked taste, going directly from the freezer to the oven or microwave. They make a fun breakfast treat, served up fresh and warm, or they can be part of these fancy fruit and donut hole skewer! Also from Farm Rich are Blue Bakery Scones that can be on your family table in minutes! This ready-to-bake frozen scone dough is made with the finest ingredients and freshest blueberries, and it bakes into moist, tender scones, giving you fresh bakery quality in the comfort of your own home! Two new hot appetizers from Farm Rich include Avocado Slices, cut from premium Hass avocados and coated with an ancho chile pepper breading. These are perfect alone, or in addition to your recipes that include avocado. Try them with the included Jalapeño Ranch dipping sauce and add a little kick! This new snack that your family will love is now available in the freezer section! Also new in the freezer section are their Pimento Cheese Bites, made with real Palmetto Pimento Cheese, cheddar and ripe pimentos. You can enjoy these crispy coated bites right from the oven, or dunk them in the spicy Red Pepper Jelly dipping sauce, which his included. Be sure to stock up on these special treats for when company stops by! Are you nuts about nuts? 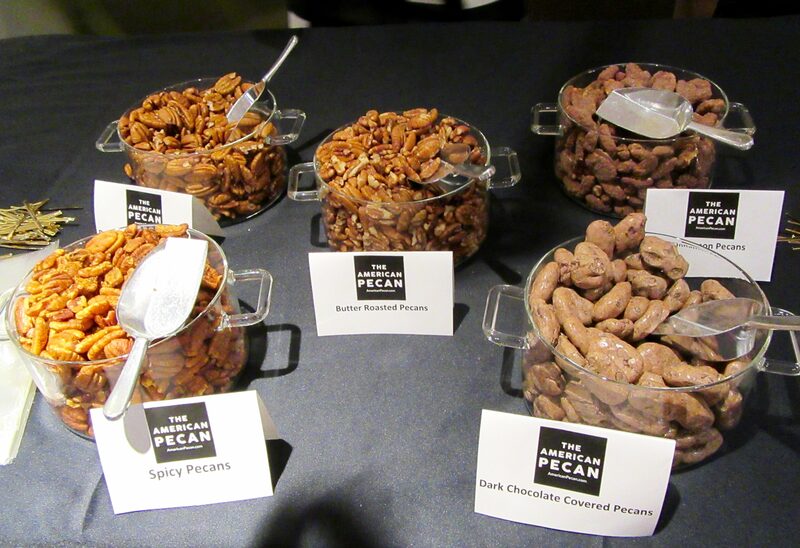 Then check out what’s going on over at the The American Pecan Council (APC), who had a Pecan Buffet ready for Snack Attack attendees to sample. The pecan is one of my favorite nuts since my Mom used to put them in her home baked chocolate chip cookies! Roasted, toasted, seasoned, spiced, or sweetened with chocolate, there is no wrong add a naturally sweet and crunchy Pecan into your meals, snacks and desserts. 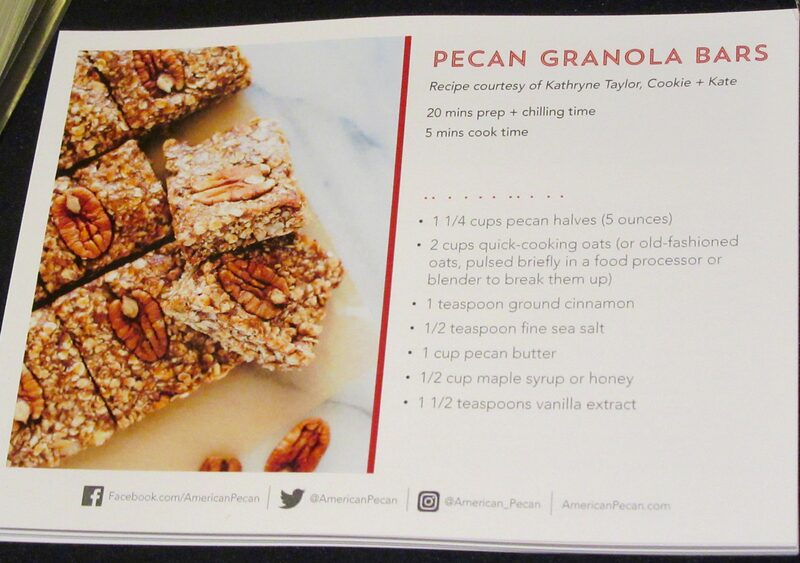 This Pecan Granola Bar Recipe is easy and family-pleasing — we got to sample the results! 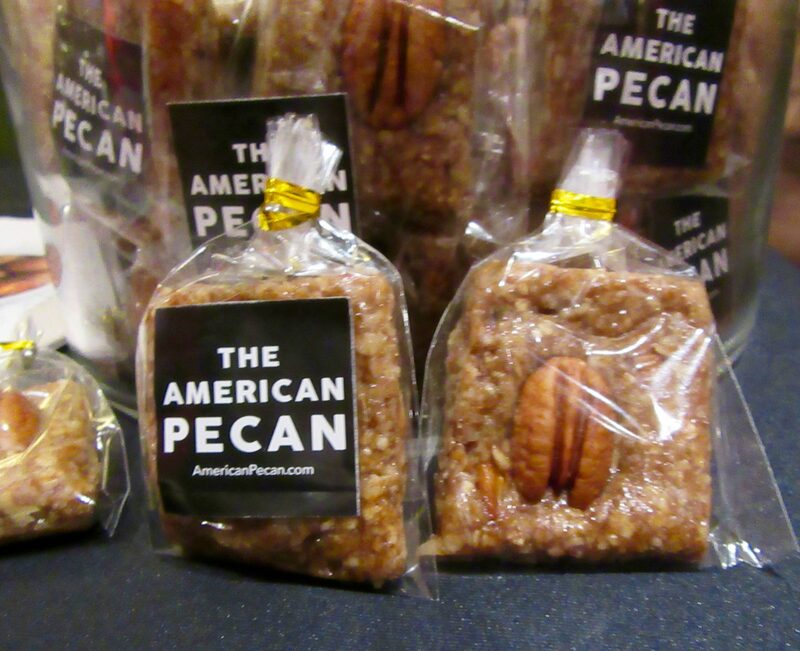 Learn more about the American Pecan, and get more recipes, at American Pecan Dot Com! Now that you’ve seen lots and lots of ideas of what to snack on, you need a cool-looking, portable container in which to store and carry your snacks. 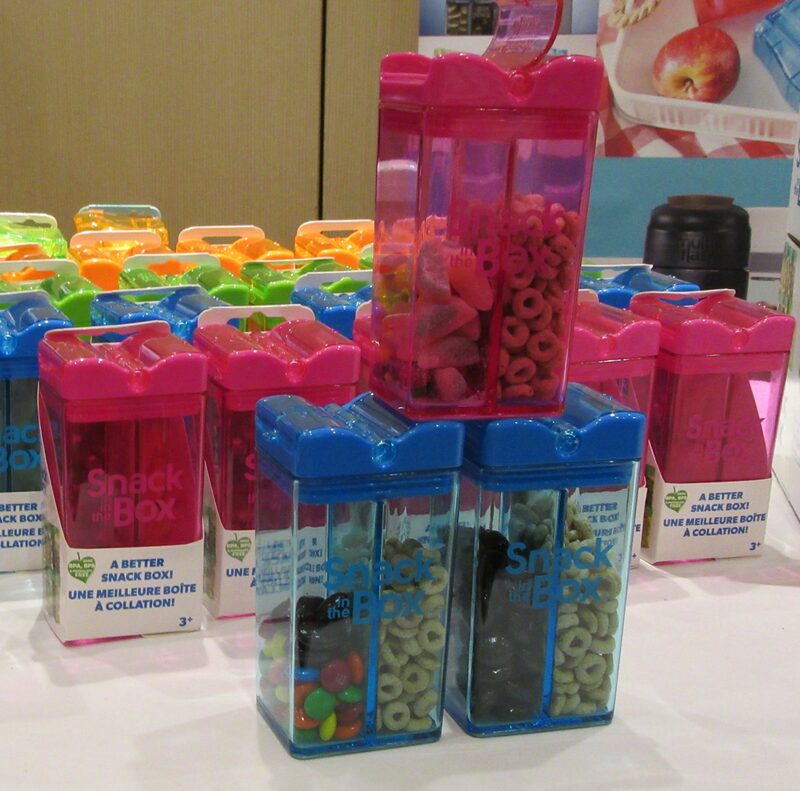 May I present Snack in the Box, designed by Precidio, a trusted name in food storage. Snack in the Box is a must-have for school lunches, car rides, bicycling, taking the kids shopping, going for walks, picnicing or anywhere you may want to bring along a treat. Just fill it with a couple of your favorite snacks and throw in it your bag! 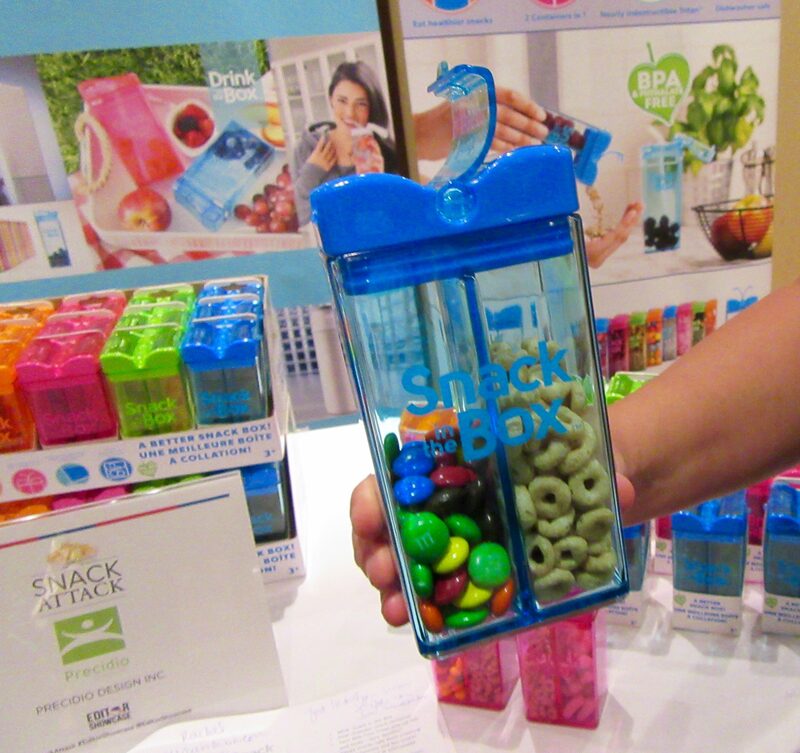 Snack in the Box is made from BPA-free plastic in an assortment bright colors, and the twin pop-up lids let you easily flip them open and pour out your favorite snacks. Now you can bring a healthy and a fun snack like fresh berries, crackers, nuts, cheese cubes or any type of dry snacks anywhere you go. And remember that you are being earth-conscious by reducing plastic bag waste! That wraps up this years’ Snack Attack. Happy Snacking Everyone! 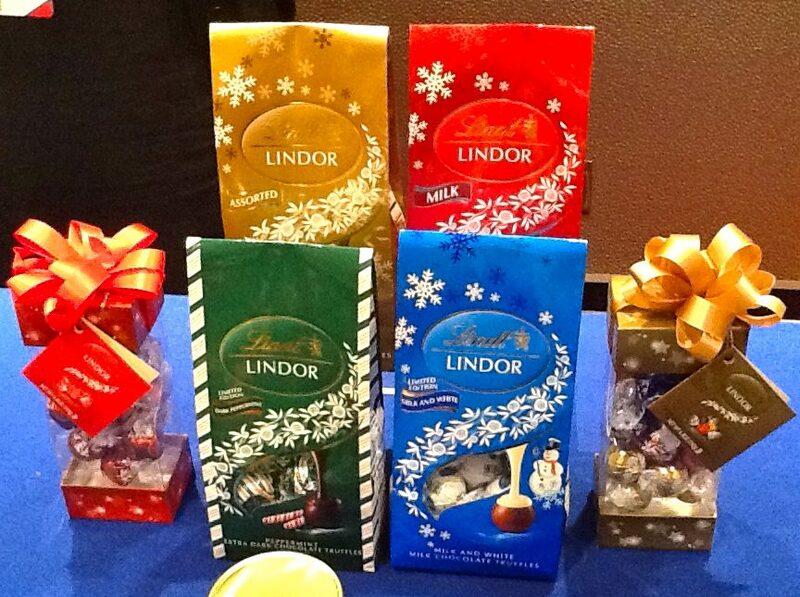 Lindor Seasonal Truffles, The Perfect Holiday Confection Gift! Holiday chocolates are, seriously, the absolute best, amiright? I realize that Halloween has only just passed, and admonishing cries of “too soon” fill the air when we start going on about Christmas, when that day seems so far away at this point. 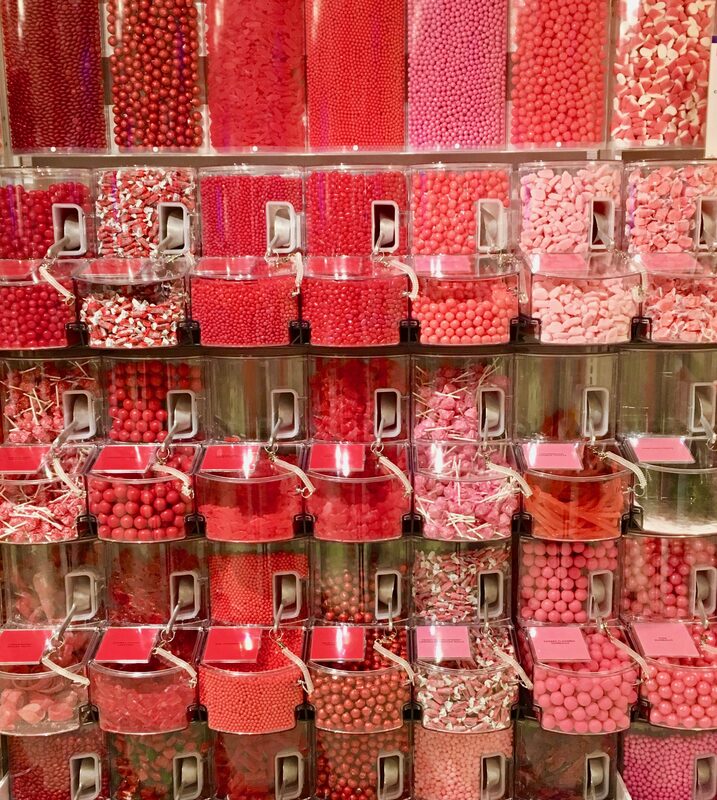 But the truth is that seasonal confections are called ‘seasonal’ for a good reason. Holiday goodies are generally only available in stores for a limited time — and if you snooze, you lose! At any rate, you can use the excuse that it is never too early to plan! 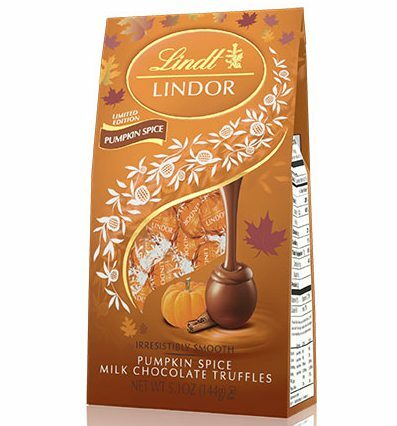 If you are like me, one of your favorite holiday treats is the Lindor Truffle; the creamiest, most luscious chocolatey morsel you can buy for an outrageously reasonable price. 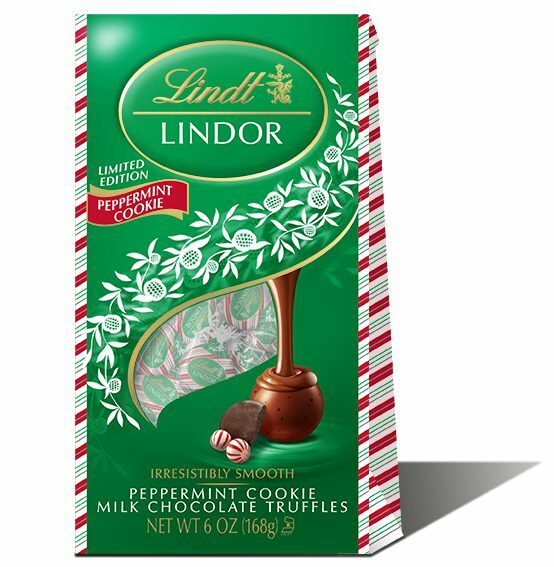 So, imagine how difficult it has been for me to not yet have written about the new Lindor Truffle Holiday Flavors, especially since I’ve known about them since this past summer! You should thank me for showing such restraint. 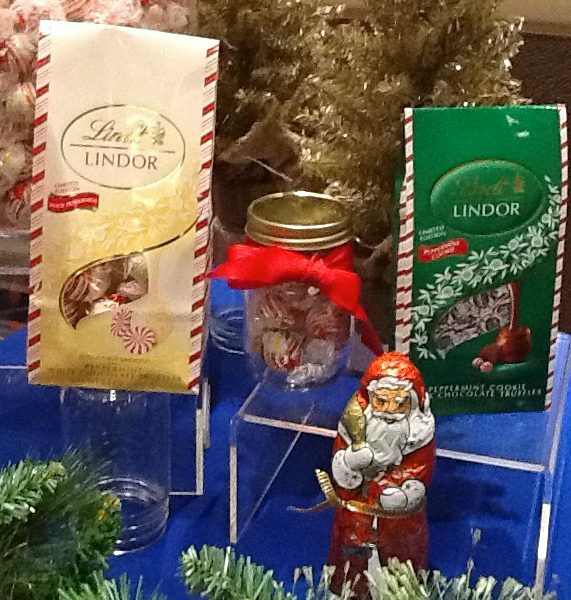 Yes, it was way back in July that I attended a holiday gift guide event (where these festive photos were taken) and had the chance to taste all of the new Lindor Truffle varieties that are making a limited-engagement appearance in stores just in time for your holiday parties and gift giving. Take a look! 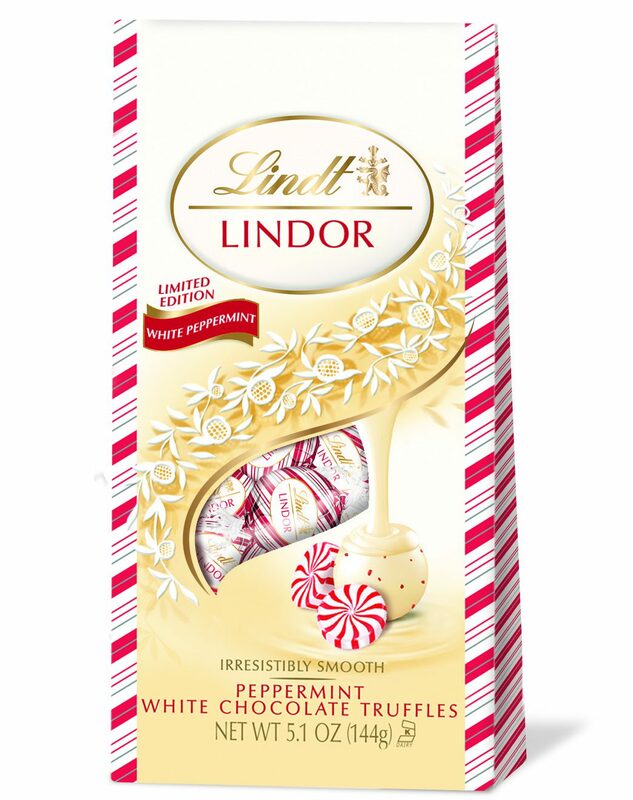 Lindor Peppermint Cookie Truffles arrive in wildly festive Lindor package design that’s so gorgeous, you don’t even have to wrap it! Just stick a bow on this bag that contains Lindor Milk Chocolate truffles infused with Peppermint and Chocolate Cookie Pieces. Insane! 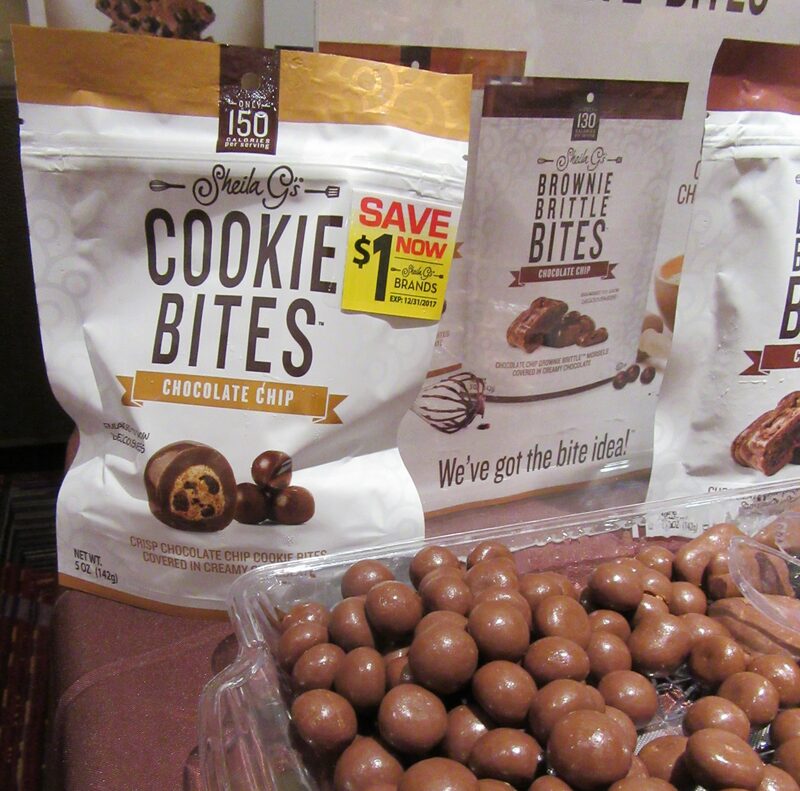 These Truffles are available exclusively at Target stores for just $4.49 per bag. Totally worth a subway ride to Target, I say! 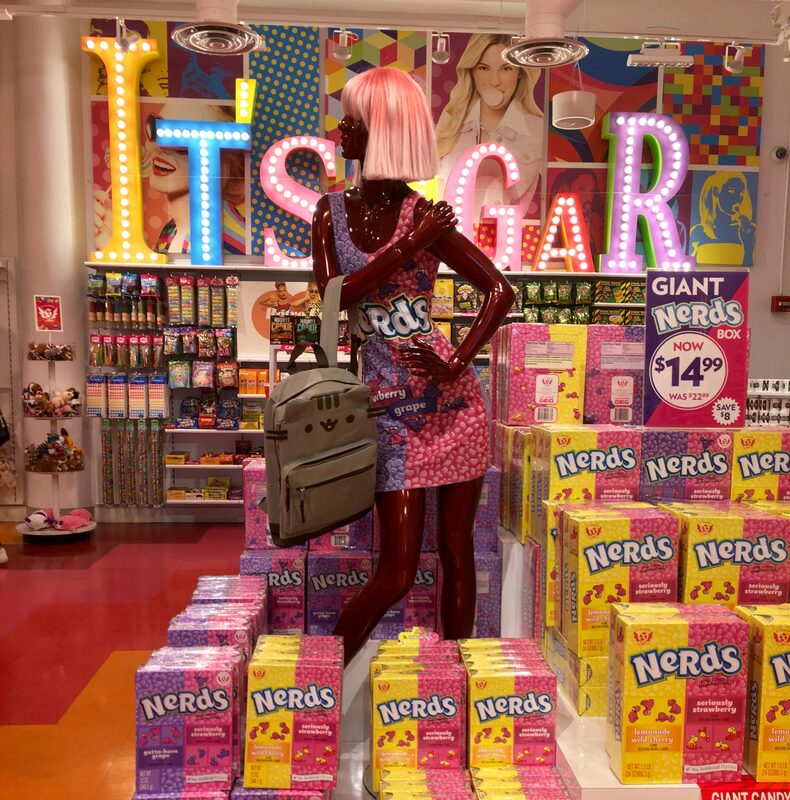 pick up a few extra bags for last minute gifts! 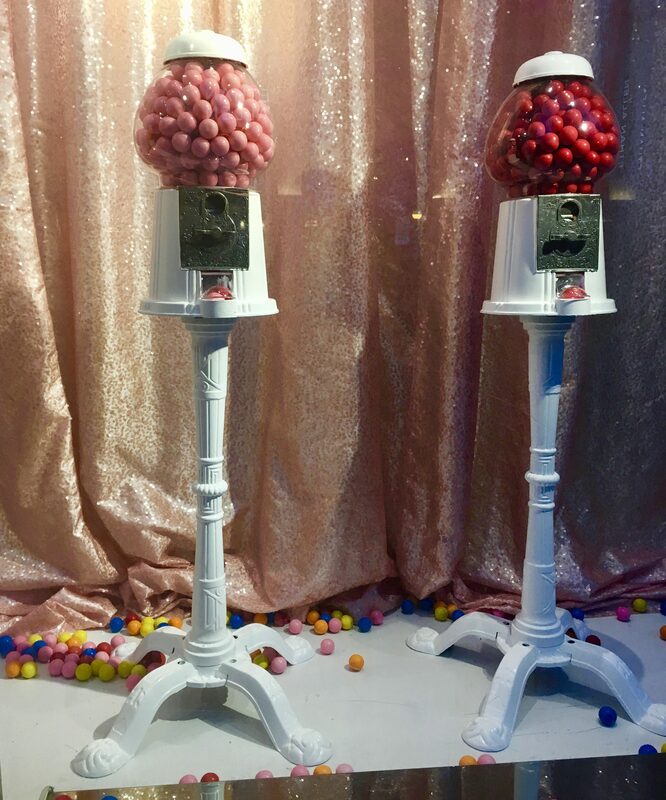 Find out more about Lindor Truffles and the entire line of fine Lindt brand Swiss chocolates, and shop online, at This Link! Happy Holidaze!